Selecting the right addon hardware for use with your Flight Simulator is very important as to get the very best out of your flying skills. To a point your selection is a very personal choice to fit to your specific needs and taste. 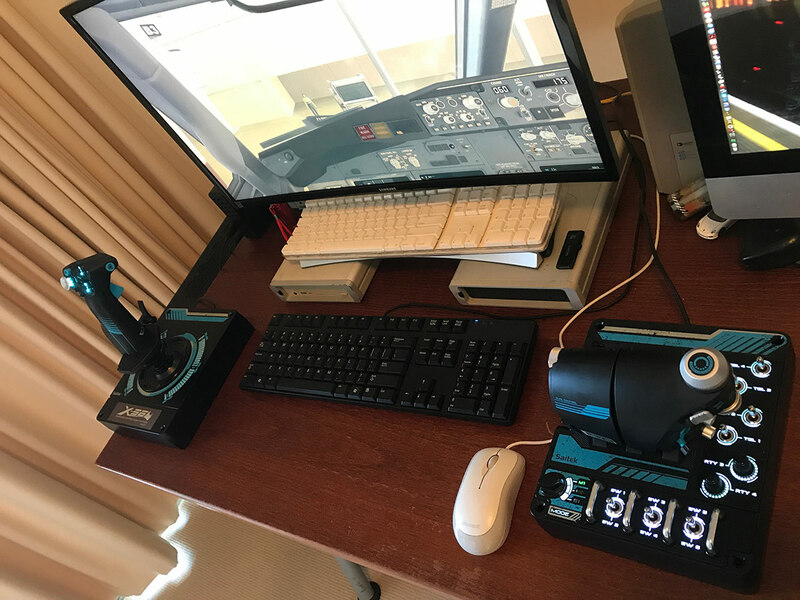 One factor is that if you have flown on simulators for a period of time you will of course find a set up that suits your flying tastes, but in most cases you usually want to replicate the same arrangements that are present in the aircraft itself and duplicate what you use on the screen in the actual hardware in your hands. There are three types of basic hardware you can purchase... Standard Joystick, Joystick and Throttle System and a Yoke and Rudder Pedal system. 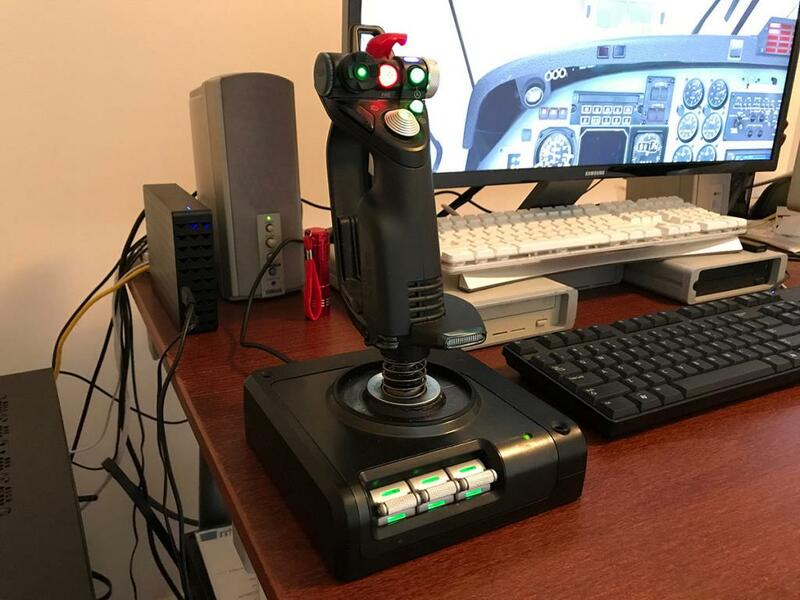 Standard Joystick : Standard Joysticks come with a X (horizontal) and Y (vertical) axis, but no Yaw (Rz axis) so in reality you will need a set of rudder pedals to get the yaw aspect. However clever X-Plane will allow you to fly the aircraft as it will combine the bank and yaw together to do turns (banks). 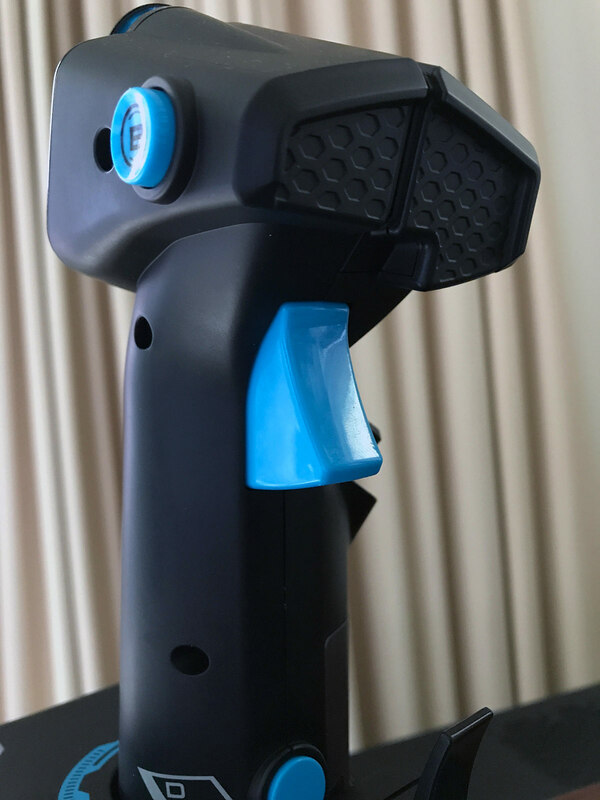 Overall although they are cheap you should avoid two-axis joysticks if you are serious about flying. 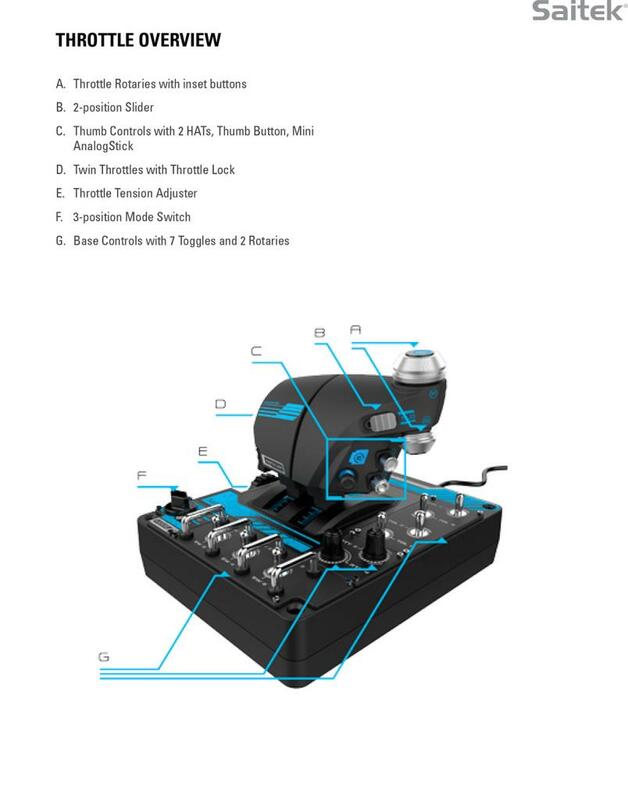 Joystick and Throttle System : A twin Joystick and Throttle System is the most popular set of addons you can buy. 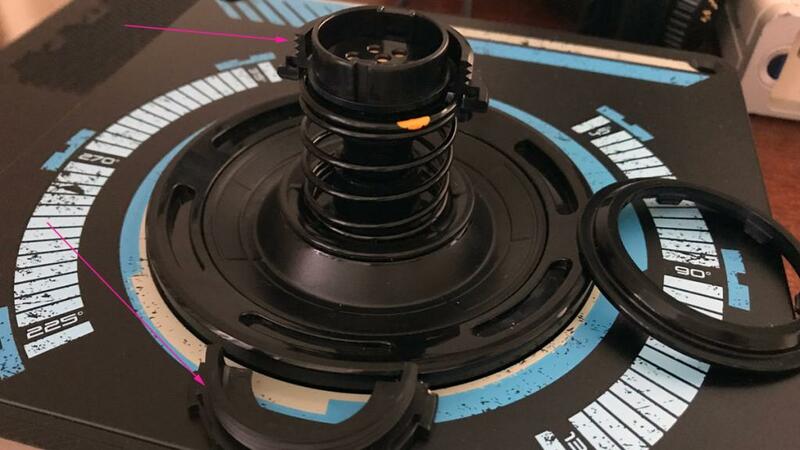 They combine the three-axis (pitch - bank - yaw) joystick with a throttle system. They also come with a lot of switches and knobs that can be set to interact with the simulator to activate your on screen aircraft. 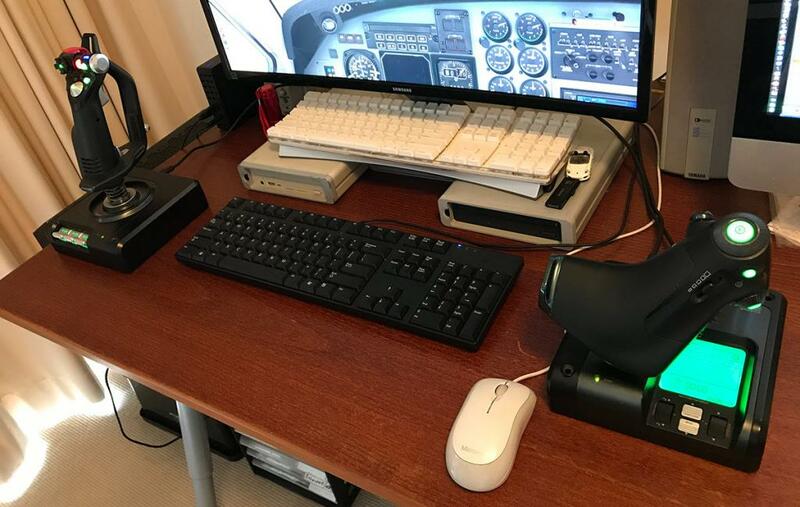 Yoke and Rudder Pedal system : A separate Yoke and Rudder system is the ultimate goal but a requisite if you are learning to fly or using X-Plane as a training tool. 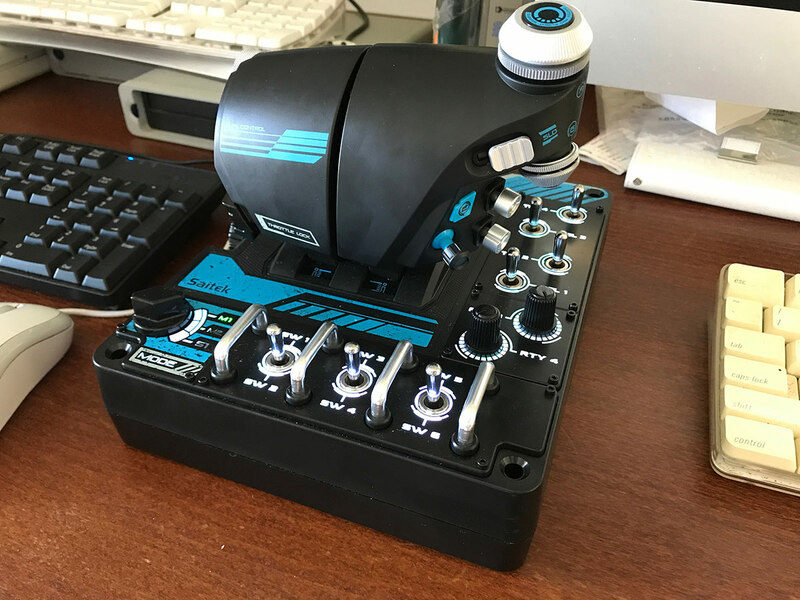 Cost is usually the barrier to a full Yoke and Rudder layout, but they are also devoid of features as well that come as standard with Joystick and Throttle systems, so in most cases you need even more addons in mostly a throttle system to get the complete setup. Over the years I have progressed through a few transitions of addon hardware. My first joystick was a Logitech Attack 3 which lasted about 3 days as I found out that with no yaw it was practically useless, but it did have 11 buttons to set. 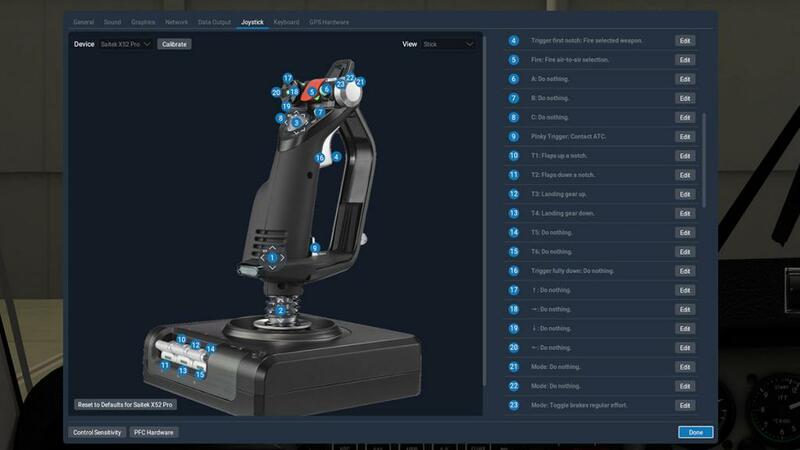 I will note as it is mentioned a lot with these systems is that H.O.T.A.S stands for "Hands On Throttle-And-Stick"
Second addon was a Thrustmaster T.Flight HOTAS X which was a big upgrade from the Attack 3. 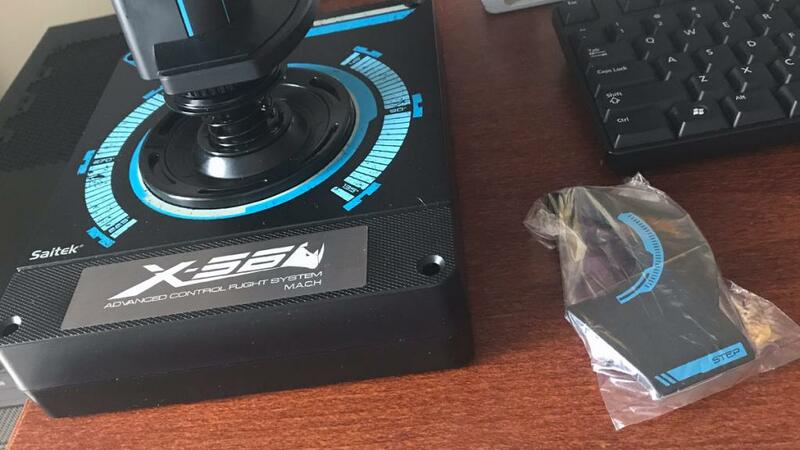 It had actually a nice joystick feel, but the layout was the wrong way around with the throttle on the left and the joystick on the right and they were connected together by the shortest cable that you could wrap around under the throttle. I added a cut up mouse pad to the base of the throttle to gain an extra precious few centimeters between the two items. Overall it was big and bulky on the desktop. There is only a small differences between the x52 and the Pro version, the colour is different from the silver to the more classy black and the spring is more stronger. The x52 was released in 2005 and the Pro in 2007. 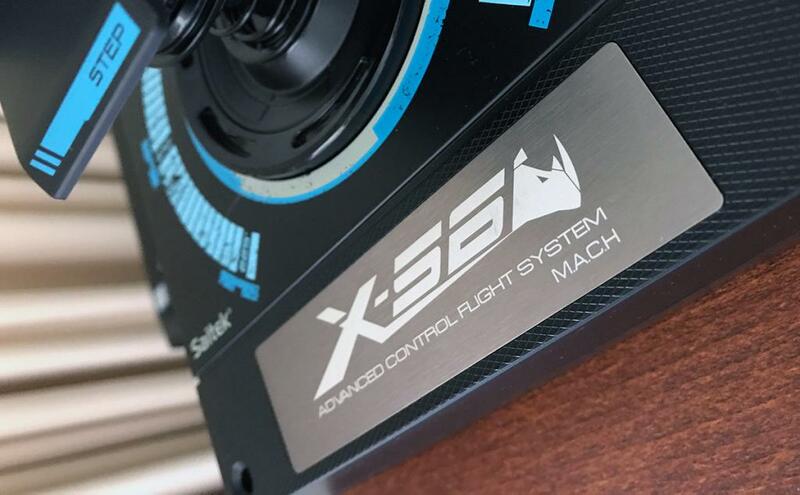 These x52's are very well liked and are really the mainstay of simulator flying, mine has been very good, but does have a few niggles that has worn me down over time. 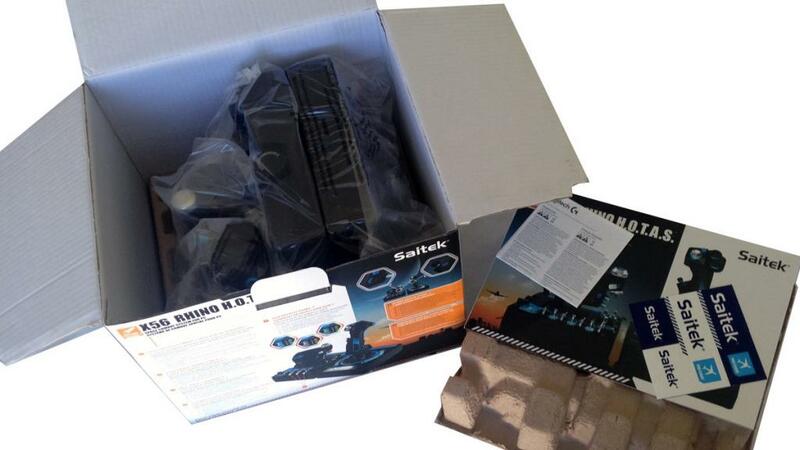 These niggles were very much in consideration when I wanted to upgrade to the next system and were very forefront in my choice of my next system. I will cover these points as I review the x56. 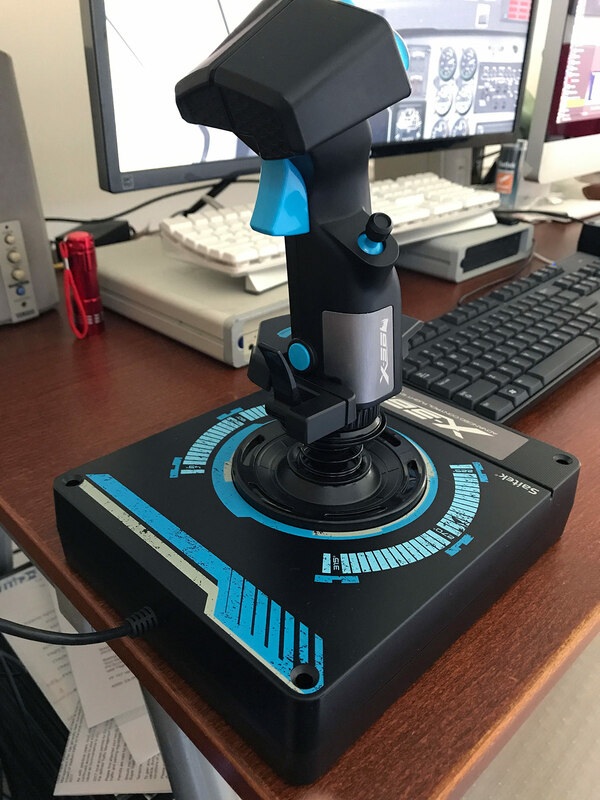 As a brand Saitek has been very dominant in simulation although most serious users swear by the HOTAS Warthog Joysticks. 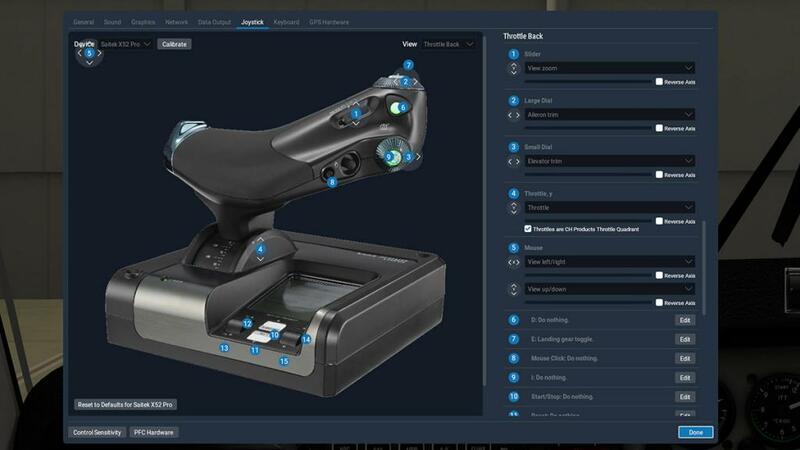 But Saitek do cover a broad range of addons for simulation, including Joysticks, Flight Panels, Rudder Pedals, Yoke systems, Throttle Quadrants and Trim Wheels. 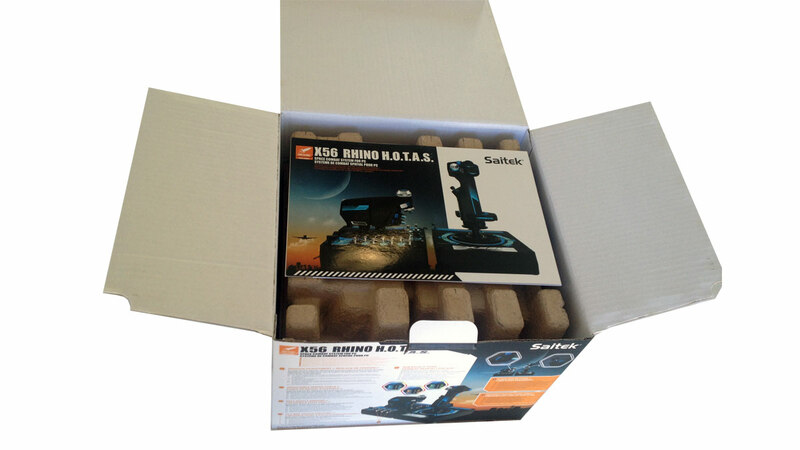 Saitek was founded in 1979 by Swiss technologist Eric Winkler as a manufacturer of electronic chess games, and grew quickly. 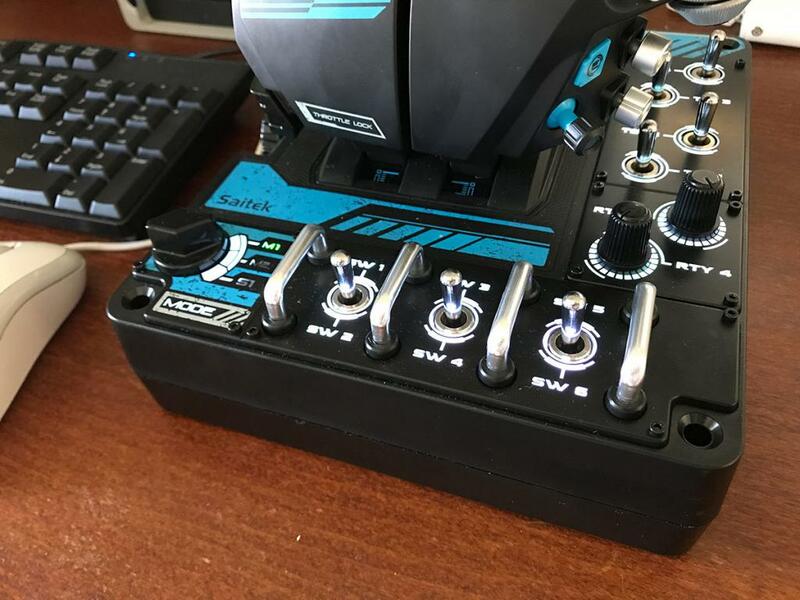 In 2007 Saitek was bought out by Mad Catz a company that created accessories such as control pads, memory cards, connection cables, headphones and other human interface devices for the PC and various video game consoles. But in 2016 Mad Catz had a sales failure with the "Rock Band" product that eventually sent them bankrurpt, but the Saitek name, products and brand live on as Logitech acquired Saitek last year for 13 million dollars. 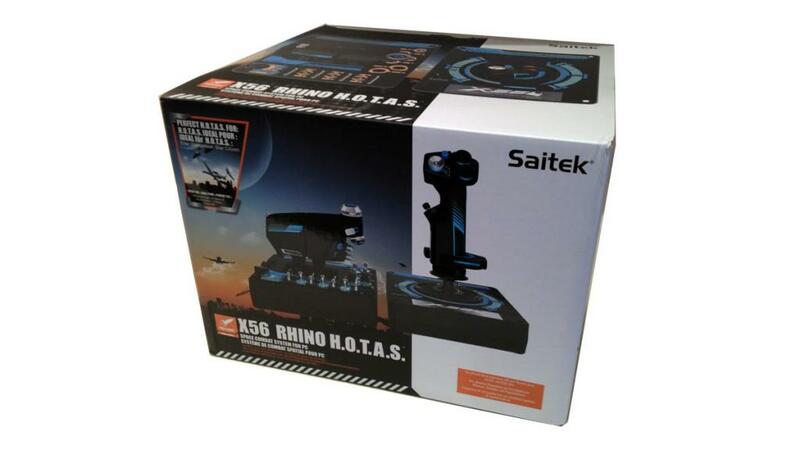 But currently the products are still listed under Saitek and not the Logitech brand banner. 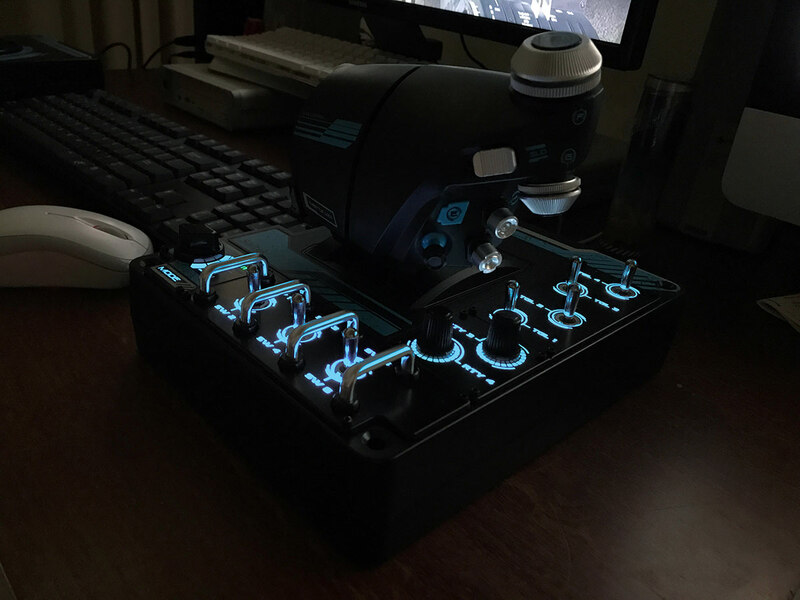 Saitek when under Mad Catz released the X65F which was a metal based system in 2008, but it did have duel throttles. 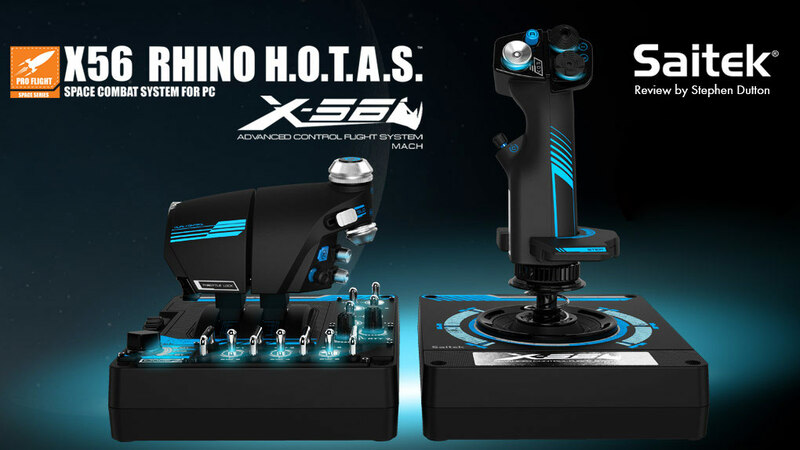 finally they followed up their x52 range with a new version called X-55 Rhino H.O.T.A.S. System in 2014. 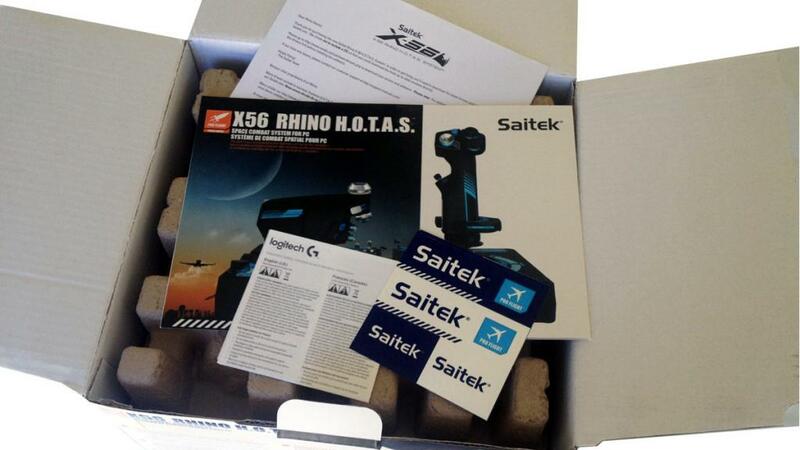 Like the x52 range there was a quick follow up with this review version here with the X-56 Rhino H.O.T.A.S. System in 2016. Differences again are small but the x56 has LED lighting and two small analog sticks with one on the stick and the other on the right throttle replacing buttons. First let us see what you get in the package. 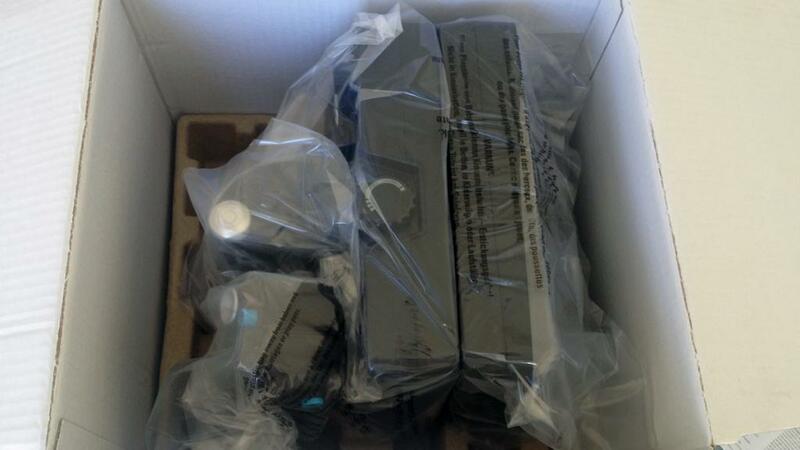 Opening up you the packaging and you have a "Thank You" letter with internet addresses for information and downloads, coloured installation leaflet and Safety, Compliance and Warranty information (Logitech) and also a nice set of "Saitek" Stickers! The very first impression is you notice is how much larger the x56's footprint is over the older x52, both units are quite large and take up a fair more space of your desktop real estate. 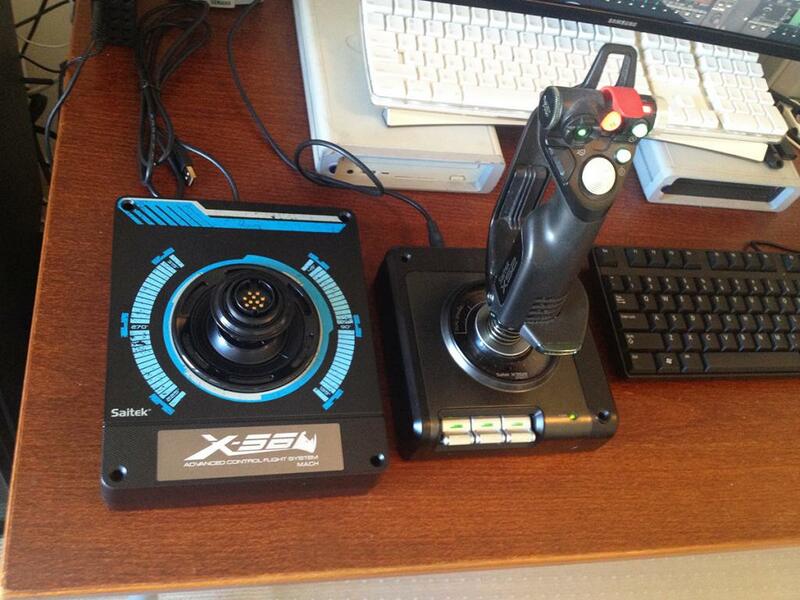 Notice that the Joystick is missing on the x56 but it comes as a complete unit on the x52. The Throttle unit looks far taller, it isn't but actually the same height as the x52 throttle but it is far, far more bulkier. 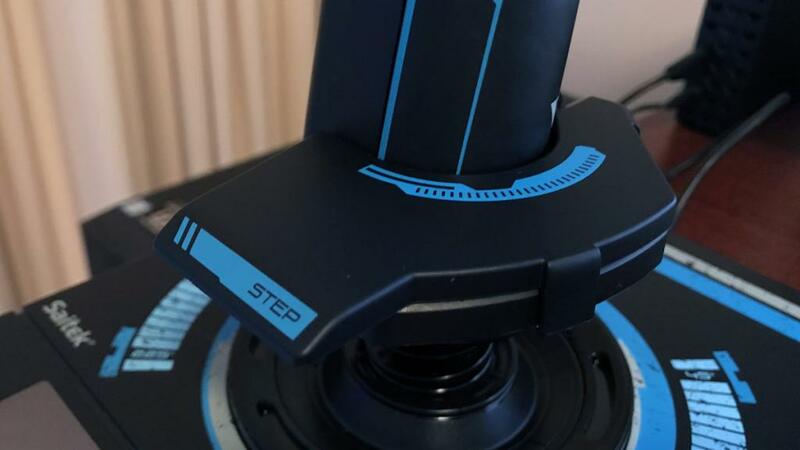 The far larger bases of the Joystick and throttle units is a significant step over the x52 versions. The system is built with a hard heavy durable plastic construction with rubber feet to keep it planted, a welcome relief as both the x52 units tended to move around when not wanted (I gaffer taped them down to the desk), but the heavier bulkier x56 units don't move around and stay firmly planted. Both units have a dazzling array of switches, sliders, buttons, rotary switches, triggers and HATS in both Witches and Castle designs. 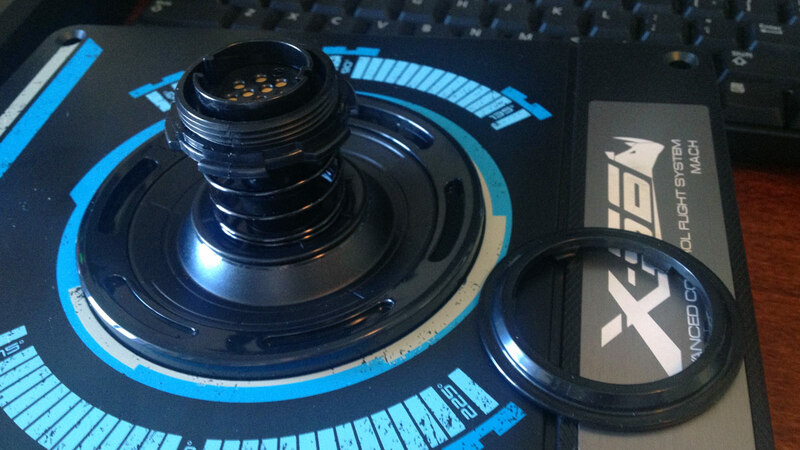 Like most joysticks the x56 stick is very much focused on the fighter or military aspect of the layout of usability. 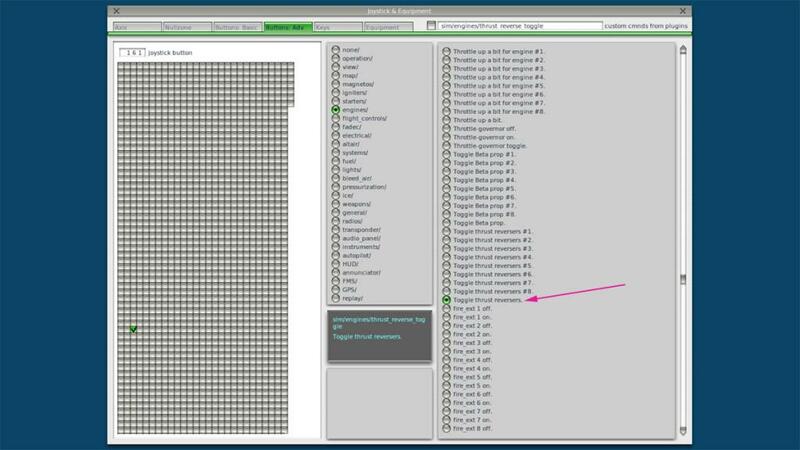 Trigger buttons and weapon selection is highlighted as is the pinky and flying pinky buttons. In airliner mode in which most simulator users operate they are mostly not required and usually set for other purposes like most high hats are used for POV or Point Of View actions. 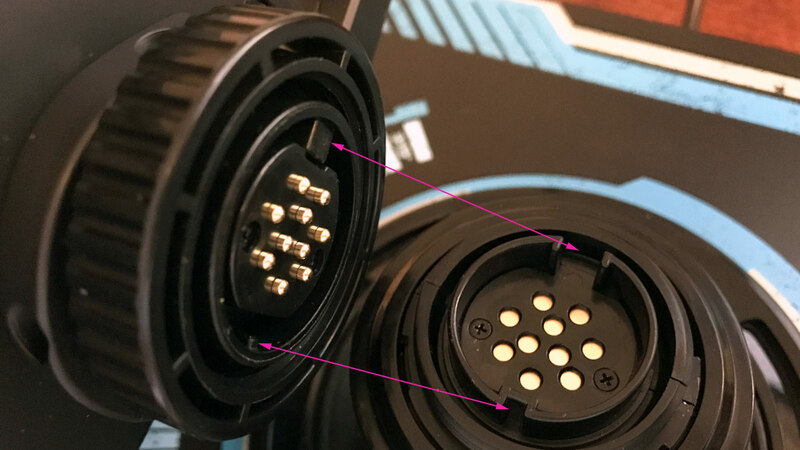 The Joystick covers all X,Y and Rz (yaw) axis modes. I was attracted to the look and feel of the throttle unit and it's wide selection of switches, rotary dials of which selection here is excellent. The switches have a quite forceful click-clack feel that I like. 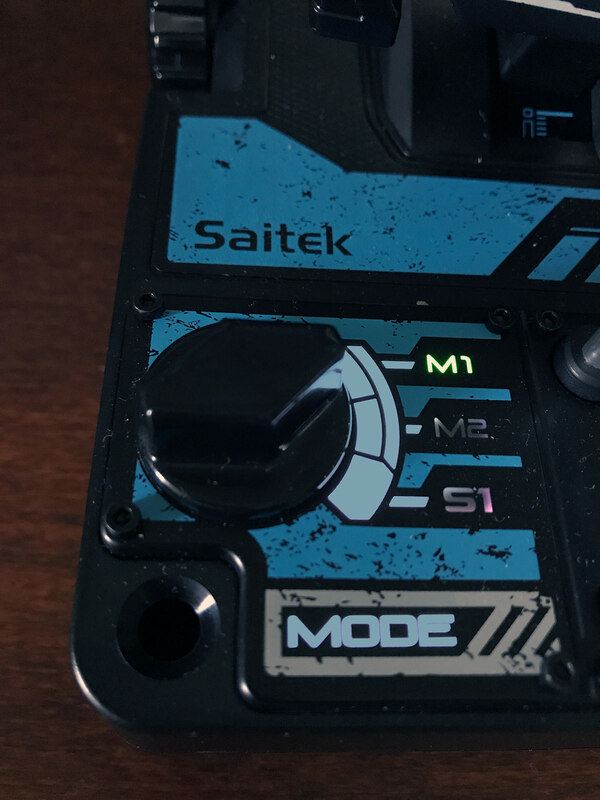 I also like the military look and feel of the front aspect switch metal separators, they allow you to feel which switch you require without taking your eyes of the screen and they look very purposeful as well. In keeping with the military aspect the design and patterns on the units are very militaristic, but the x56 blue looks better the the same x55 yellow design. 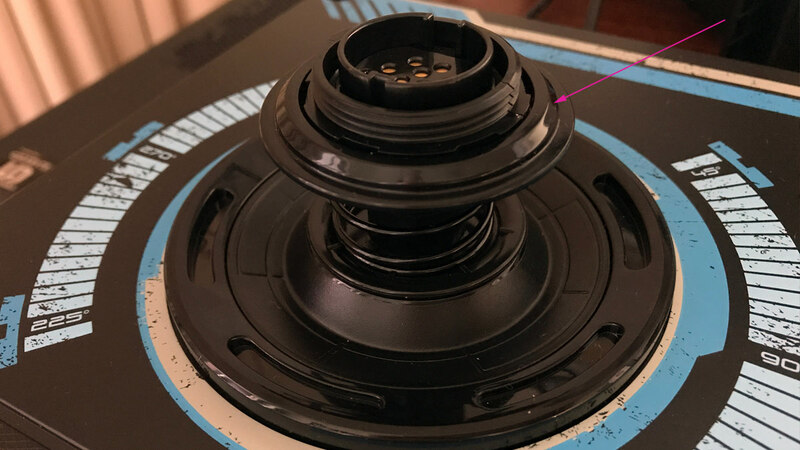 The base of the Joystick does not have any switches installed at all now, as it is a clear square base... and for all the better for it. The main three toggle switches have been moved to the Throttle unit as upright switches more than the key switches on the x52. 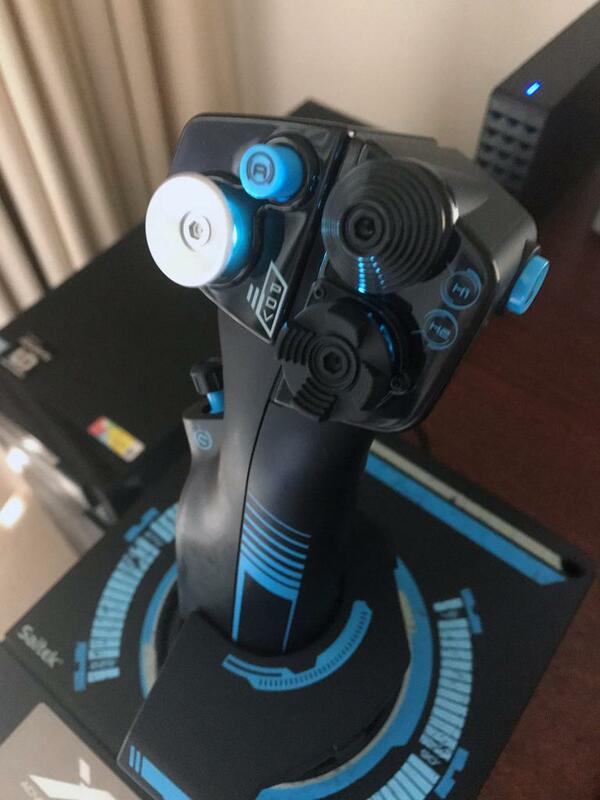 This was one of my biggest reasons for selecting the x56 as you had to crossover arms (right under left arm) to activate the switches (speedbrakes-landing gear-flaps) while taking off or landing... now they feel they are in the correct place. I usually set the switches to replicate the same as on the pedestal in speed brake lever (right) landing gear up/down (center) and flap lever (right). Night lighting of the units is excellent if quite beautiful. The Joystick now only has lighting at the top and it is a subtle blue and all the switchgear lights up blue on the throttle base. You can change this LED lighting to almost any colour you want, but I couldn't make the software work (see below)? Throttle has POV and one each witch and castle selectors. One button facing you and one on the right side and a large trigger button rear. I usually set my servo toggle (autopilot on/off) on the front button and nosewheel toggle select side, the trigger is set at "Toggle thrust reversers". 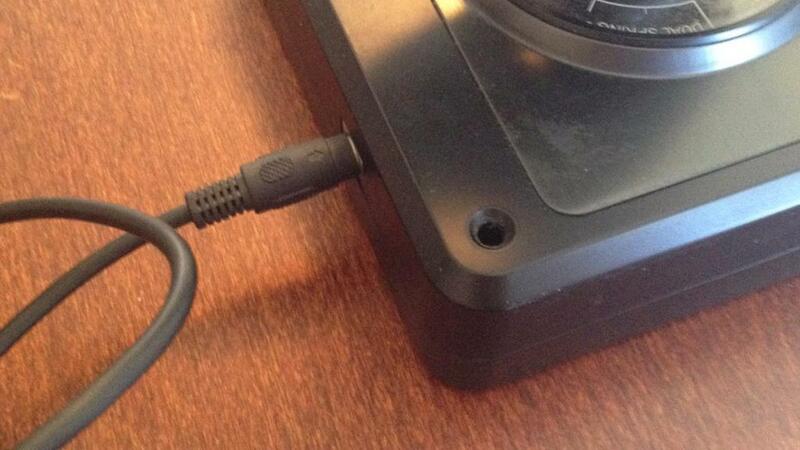 There is a toggle switch halfway down on the left, and around the base a pinky button and flying pinky lever. 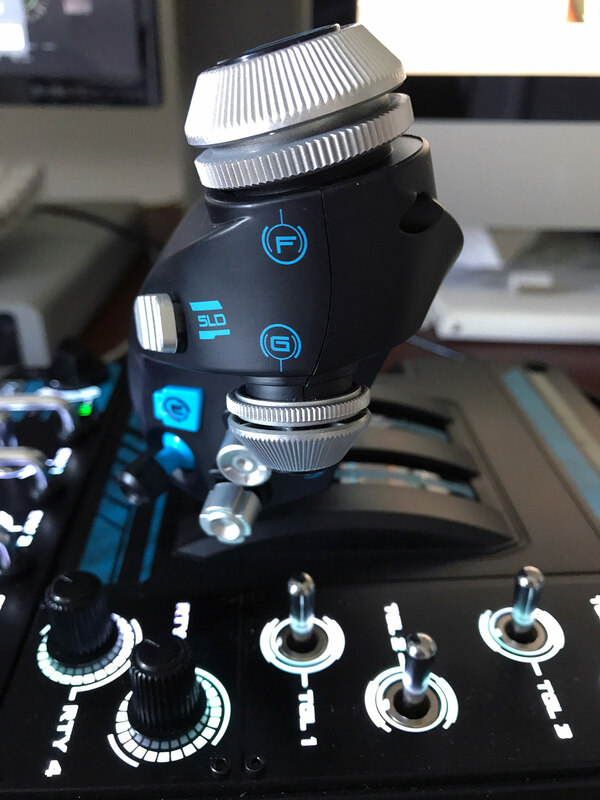 Now I wasn't sure of the lever gizmo, as I usually set my brake (regular) on this button, but here I was able to use the lever for the regular brake (50%) and the pinky button for the full brake toggle (100%) and I love the setting up, it works really well. On of the big highlights for me was the advantage of dual throttles. They actually take a bit of getting used to as they are quite touchy in adjusting the aircraft's rpm, this is a more a nice to have though than a pain to have. If you wish you can lock the two throttles together as one via a lock shift on the lower left throttle you can, but on three to four engined aircraft you have to reset X-Plane as one whole throttle setting and if not only the 2 and 3 engines adjust. Separately each throttle is quite nice, but push the two together and it is quite stiff to use (still new?). There is an adjuster tightener on the left side, but it doesn't seem to make that much of a difference? 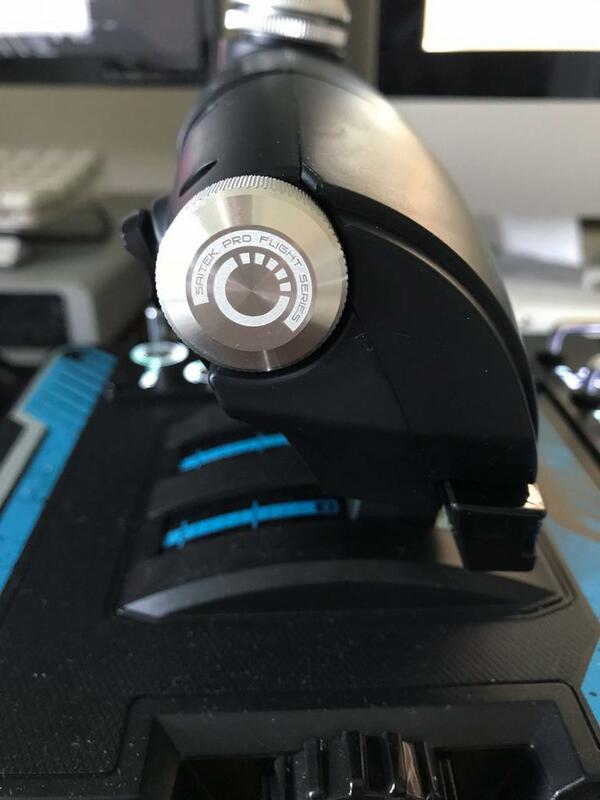 Most users say it is too stiff, but I got used to it quite quickly, and if the base slided around with the force of moving the stiff throttles then they it would be an issue but it doesn't. On the rear of the throttles are two buttons on the right handle and a two way selector on the left, I set my "full reverse thrust" (propeller) setting on one of the rear (I) buttons. 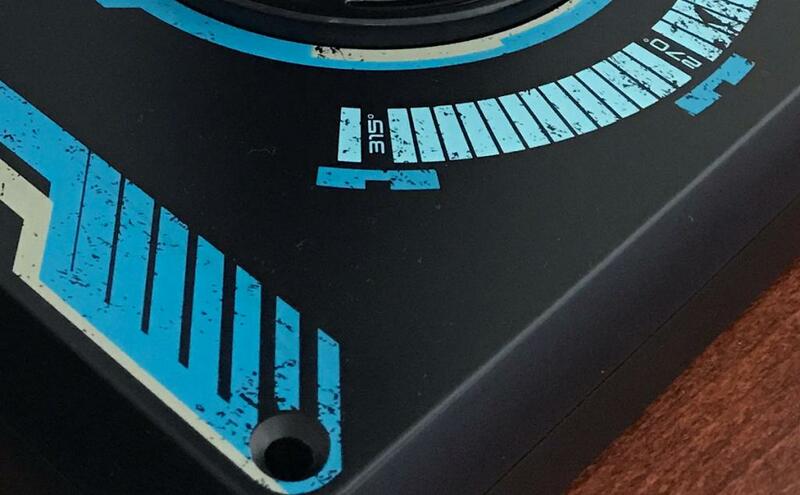 On the right throttle there are two axis wheels (F) & (G) top and bottom. Most users found them very loose, but mine are not that bad but they could be tighter. Top one I sometimes use as a tiller taxi adjustment. Front side right throttle is the noted "SLO" slider but it only selects button selections. 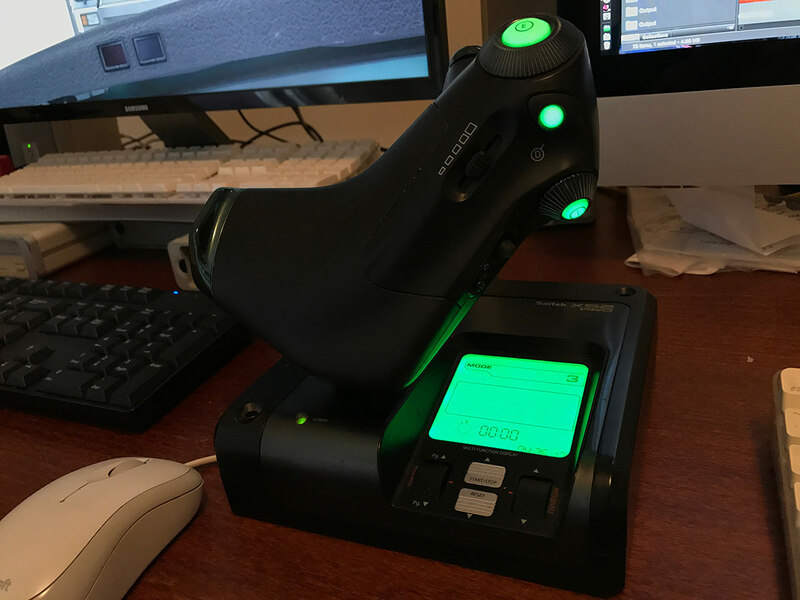 Left throttle side is a vertical wheel but in X-Plane it accesses two buttons. Lower side right throttle is a set of two (H3) & (H4) toggle switches for button select and one toggle switch left for axis selection, above is a single button (E) which I set for "Speedbrakes retract full". 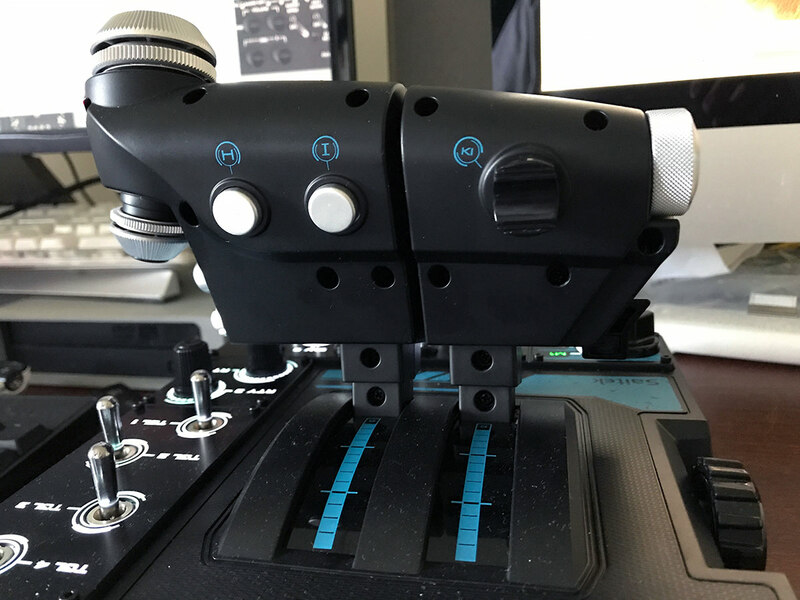 On the base of the throttle unit on the left is a great three way switch selector, it is for "Mode" selection but in X-Plane it is just a selection for three separate button selections. I want to make the best use of this switch, but I haven't yet decided what to use, maybe fms1, fms2 and GPS selection. There are three chrome switches front in SW 1-2, SW 3-4, SW 5-6 to which I set as noted the speedbrakes-landing gear-flaps. For speedbrakes it is (lever) up and down one setting, for Landing gear (lever) it is up/down and for flaps (lever) up and down one setting. On the side there are two nice feel rotary knobs RTY 3 & RTY 4 and another four chrome switches. The knobs again can be used with X-Plane's axis (I use one for a separate GA throttle adjustment and one for GA mixture). The four rear switches are TGL 1-4 which I use for aircraft lighting (Landing & Taxi) and livery next and before selection. 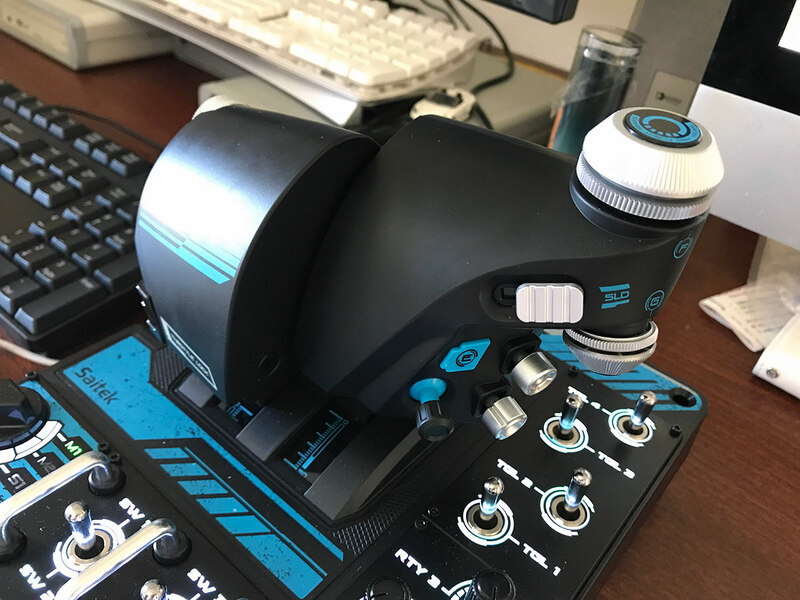 Overall the selection (total of 231 selections available) and the choice of buttons and switches is excellent on both units, but I really like the way they are grouped on the throttle base as it looks and feels like a real pedestal system (Which I think was the general idea). Both units come with separate 2m USB cables. Although this does take up more USB sockets the system is far more flexible than the connected together x52 cabling which ran a connecting cable from the Throttle to the Joystick. 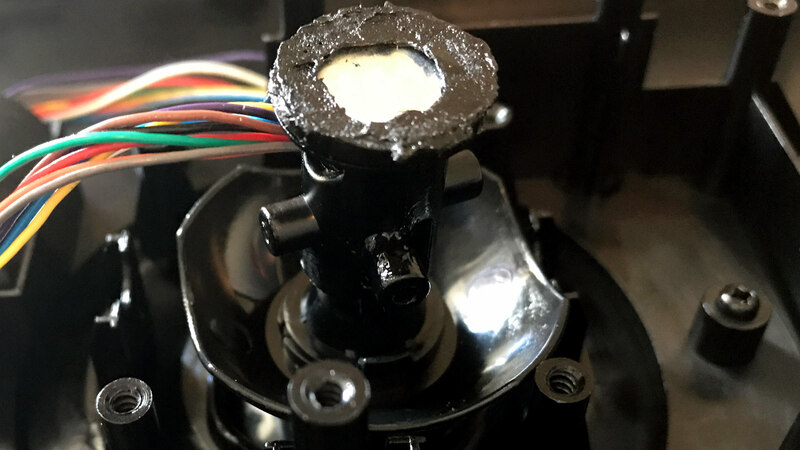 The connector on the rear of the x52 joystick would sometimes becomes slightly loose in creating a flip on the screen that got worse over time as it aged. 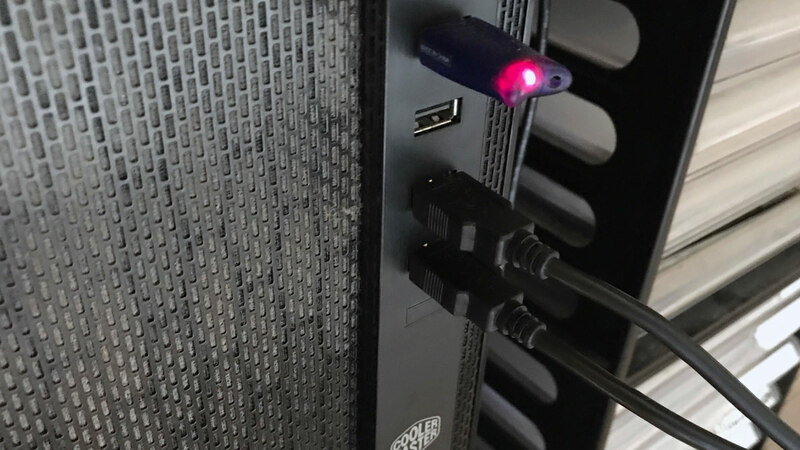 Two separate USB cables also gives you more length of cable to the computer as well and eliminates the chance of another disconnecting connecting cable issue. One of the big features introduced on the X55 and continued on the x56 is the choice of spring force on the joystick called the F.E.E.L. Spring System. 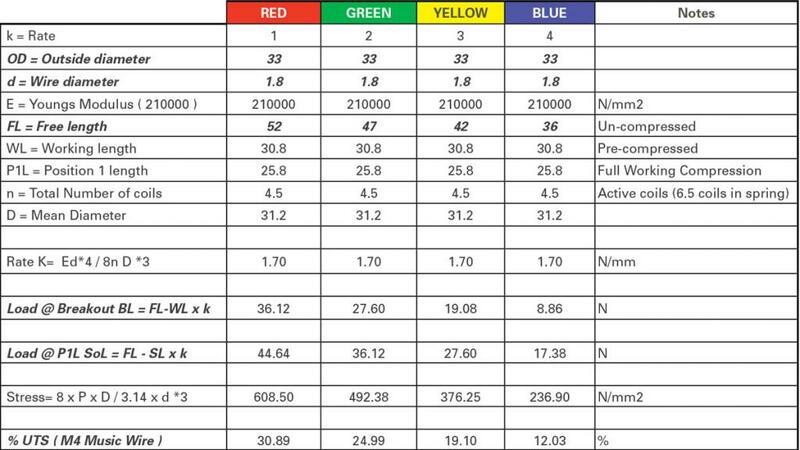 Red has the maximum resistance and the Blue the lowest with Green and Yellow set between on a scale, I personally selected the Yellow (I tried all) as the Blue was a bit too weak and the joystick a little too floppy. But I didn't want a high resistance either. 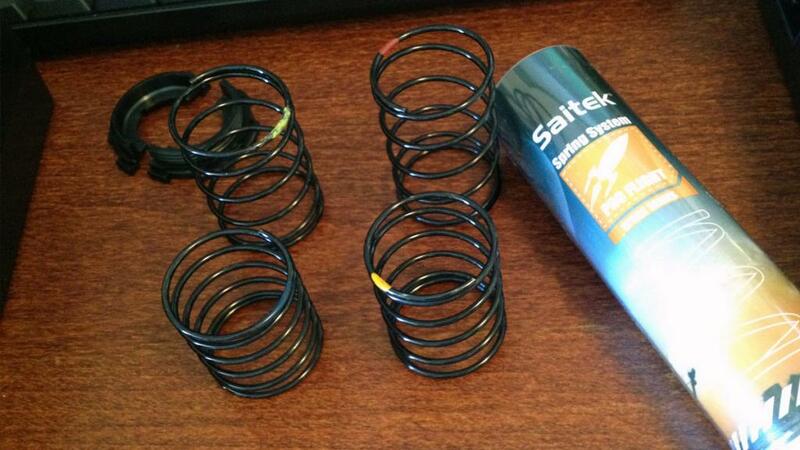 Changing the springs is easy. 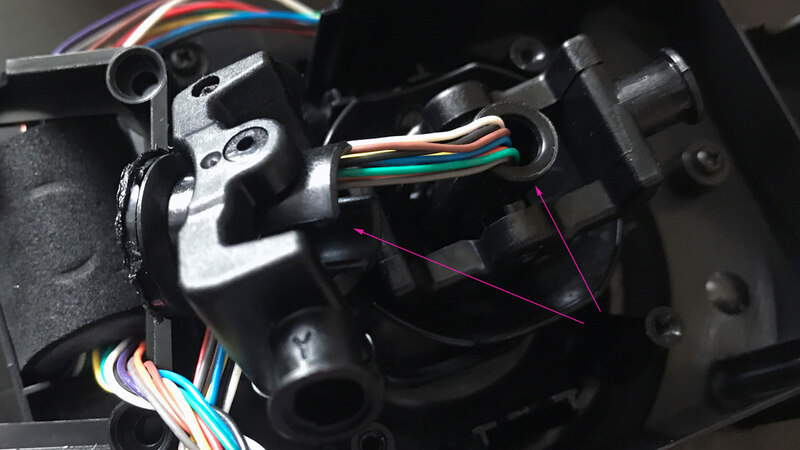 There is an outer collar clip that comes directly off upwards, then there are two side clips that come off sideways that holds the spring in place, but you will need to use a slight pull on the spring downwards to release the force on the clips to pull them out. Replace the new spring and again hold the spring down while you put the two side clips back into place (they will only clip in one way) then release the spring and make sure it is centred correctly. Then replace the collar clip to hold the two side clips in, but make sure the collar clip is correctly down and seated, if it is slightly set on an angle then it is not. It feels very solid when in and you know it is correct via the click it makes as it seats down and feels locked and level. 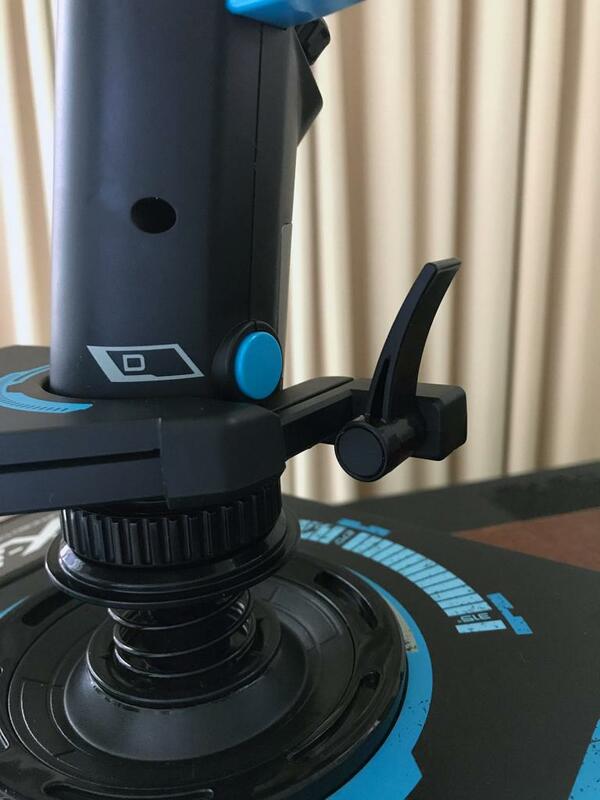 Now you will need to fasten on the Joystick handle to the base. There are large and small guides on each section, so it is easy to match up. 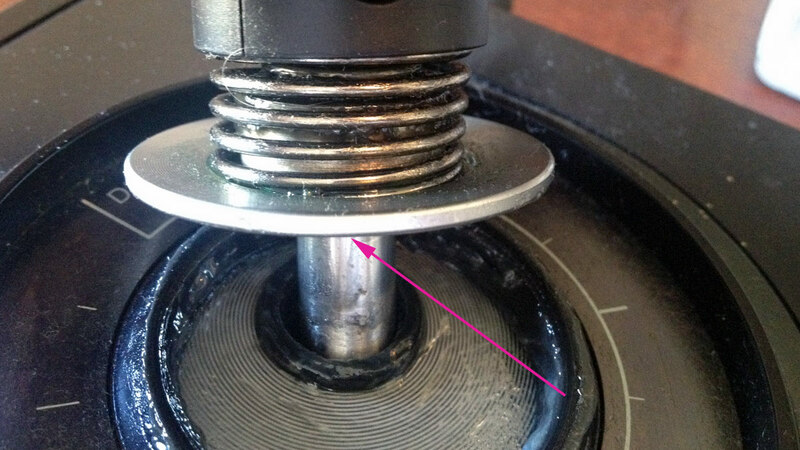 Then when correctly seated just turn the knob to secure the handle to the base, you don't have to over tighten because it will be hard to turn off again if you do. Note the outstanding pins to connect to the base section, so no tight movement means no wear. There is step plate you can add to the joystick to raise you hand rest a little. This addon just clips on and just make sure all the clips are connected, if not it will work loose. I do have a strange way of using the joystick, I use the base mostly with my lower palm against the rest. I don't use this position for taking off or landing obviously, but when I want fine adjustment like with taxiing or helicopter flying I find I have a more minute control. That is the Hardware set up completed. 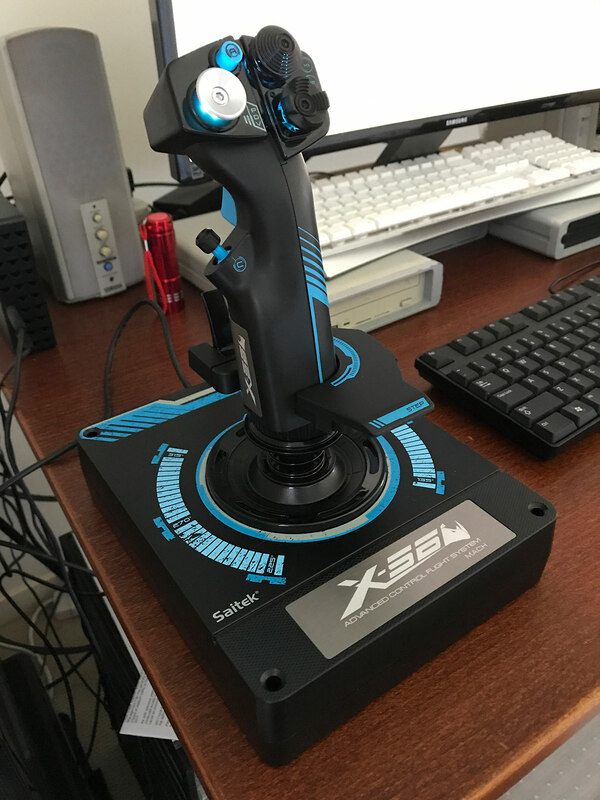 With the x52 you received a DVD with all the drivers and manual required, but that aspect of delivery is now long gone as everything is now downloaded from the Saitek site. 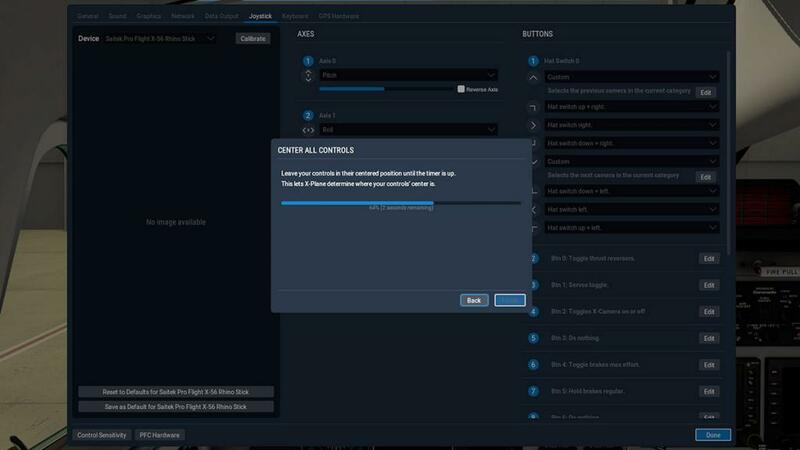 You can download drivers for the x56 system but make sure you select the 64bit versions for X-Plane. There are three drivers you can select for Windows with a x56 Rhino software, x56 Rhino Driver and a X-Plane (64bit) driver. 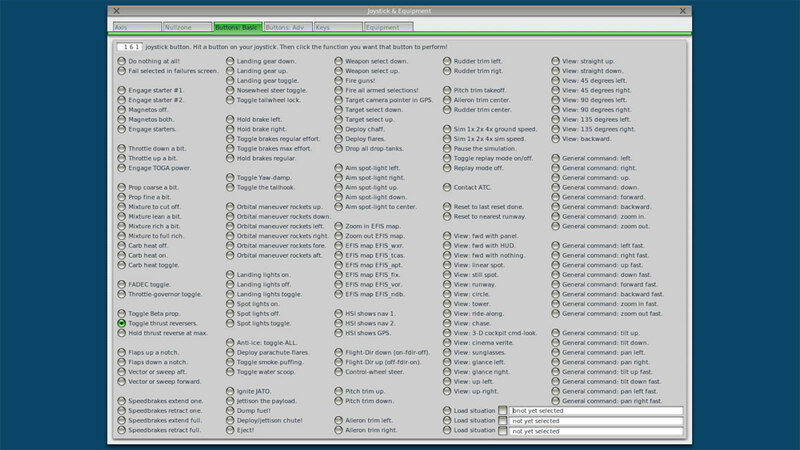 The x56 Rhino software includes HUD software and need to have Microsoft's .Net installed to work. The HUD allows you to set response curves and deadbands. But I found it wouldn't install? It feels however out of date with a Mad Catz logo and notes my computer (Windows10) won't run the software. I was disappointed as the software gives you access to changing the LED lighting and creating Profiles that remember your settings and can be changed or recalled if you use different flight simulator products. 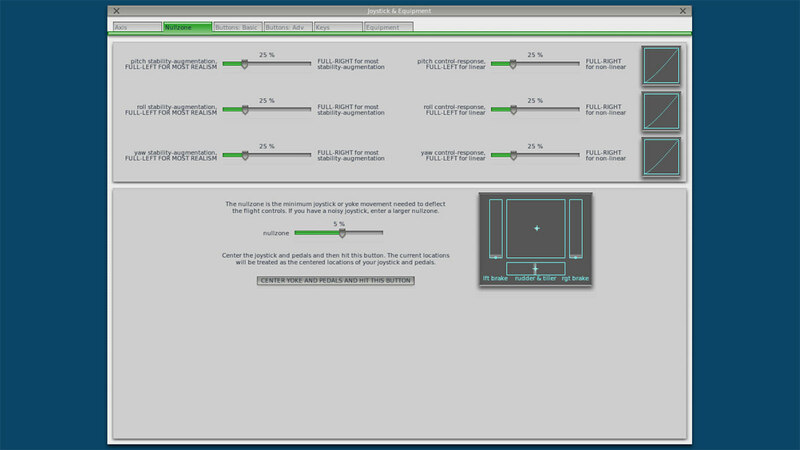 In reality for the main response curve settings it is not needed as because X-Plane has it's own response curves settings under the "Joystick" menu tab, Only the Windows driver needs to be installed from the above as nothing is required for X-Plane and Apple Mac computers as will both run X-Plane without any drivers, no drivers for LINUX either so I suppose that LINUX will work as the same as the Mac system (Mac and LINUX do share the same basic root software). 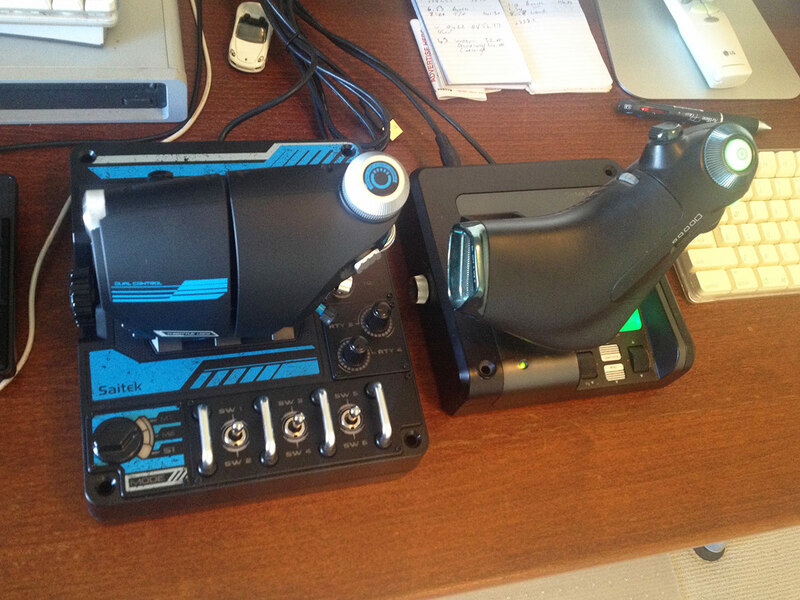 The setup for the Joystick and Throttle in X-Plane10 is quite easy. 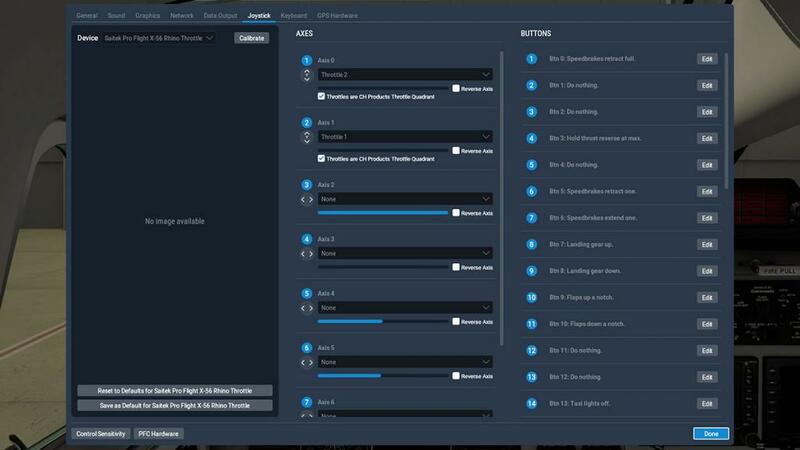 First go to X-Plane10's Menu and select "Joysticks & Equipment" then the "Axis" tab. If you have connected up x56 correctly with the two USB's then the Joysticks actions though out the all X,Y and Rz (yaw) axis should show on the sliders, red is not set and the green is correct, just move the stick around in every position to set. Then in the side menu selection by each axis you have to set the correct axis to the command like "Pitch" or "Roll" or "Yaw". Same with the throttle selection, but in the side menu you have to select "throttle 1" & "throttle 2" for each throttle. 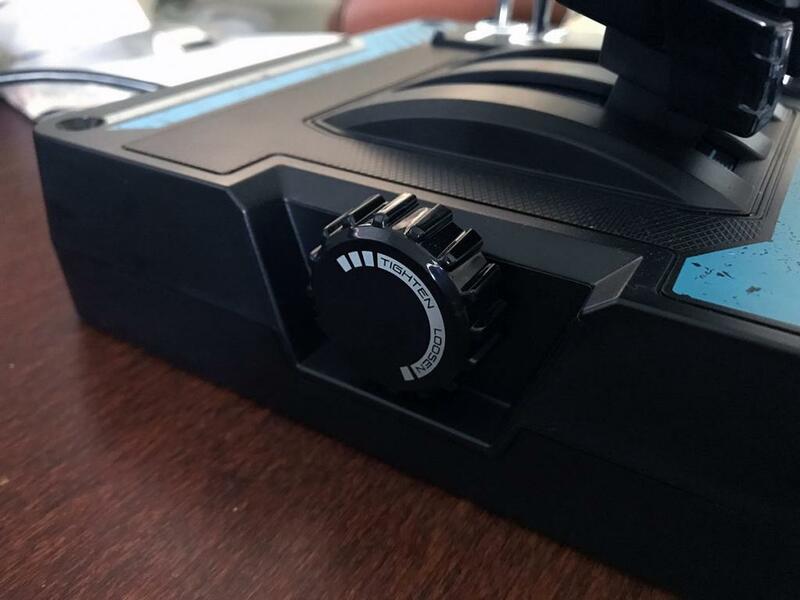 Both Joystick and Throttle rotary settings are also set with the sliders as well the same way. To reset all settings then just press the "Calibrate Joystick Hardware" button. 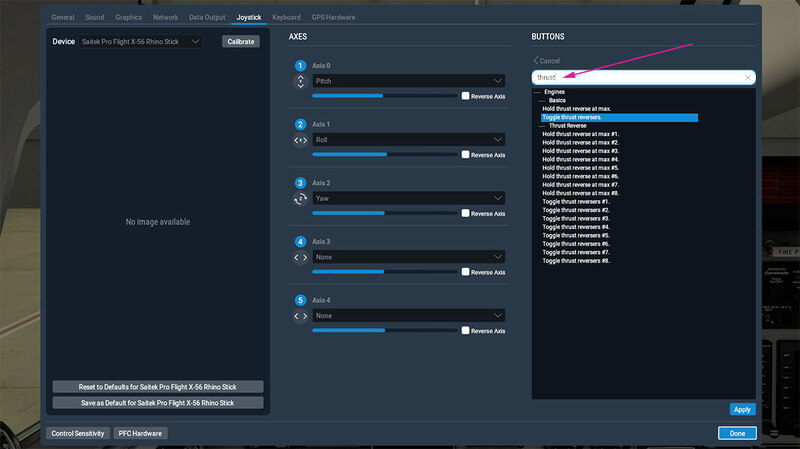 The "Nullzone" tab allows you to set the joystick response curve settings for augmentation and response (0-100%), you can set the joystick's nullzone as well, but if your x56 is new it should be pretty good. When you are happy with the settings then set via pressing "Center Yoke And Hit This Button". Button, switch, trigger and HAT settings are via either the "Buttons: Basic" and "Buttons: Adv" tabs. Just press the button or pull your trigger on either your Joystick or Throttle and it will show on either tab. The button allocation number is shown in the box top left. The Buttons: Basic though is just that a basic selection, so mostly all settings are usually done on the "Buttons: Adv" settings. Again press or pull your trigger or button to see the item you have selected, then select the item area (eg: engines/) and select the option you want on that button from the right column and in this case "toggle thrust reversers". The setup menus are all changed for X-Plane11, and what a difference it is. The location is on the new "Joystick" tab on the right side menu. There is a totally new visual look to the interface, but this is the x52 (below) and not the x56 to show you what it is like, as the x56 graphics to date have not been done by Laminar Research (the x52 only appeared a few weeks ago). 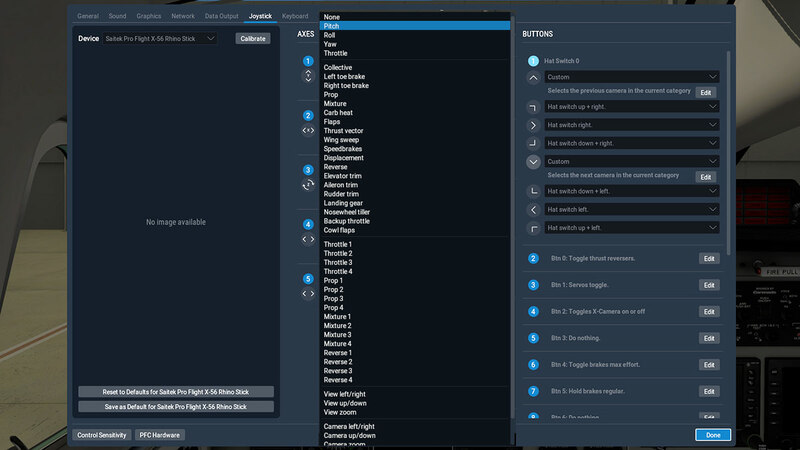 The x56 menu is unlike X-Plane10 in now it is split into two sections for each component in a display page for each both the Joystick (below left) and Throttle (below right). 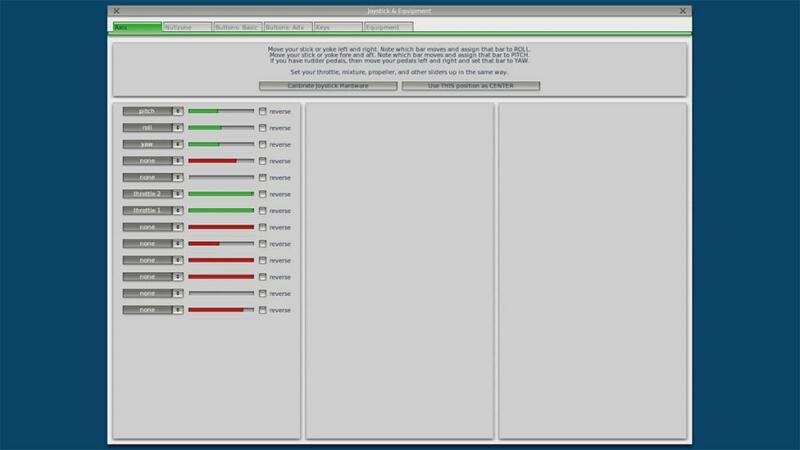 Each display page is selected via the dropdown menu top left under "Devices"
Press the "Calibrate" button to set up your axis settings. Again you move your Joysticks actions though out the all X,Y and Rz (yaw) axis and X-Plane will record your movements and you can then set set the correct axis to the command like "Pitch" or "Roll" or "Yaw" from the drop menu on that slider. 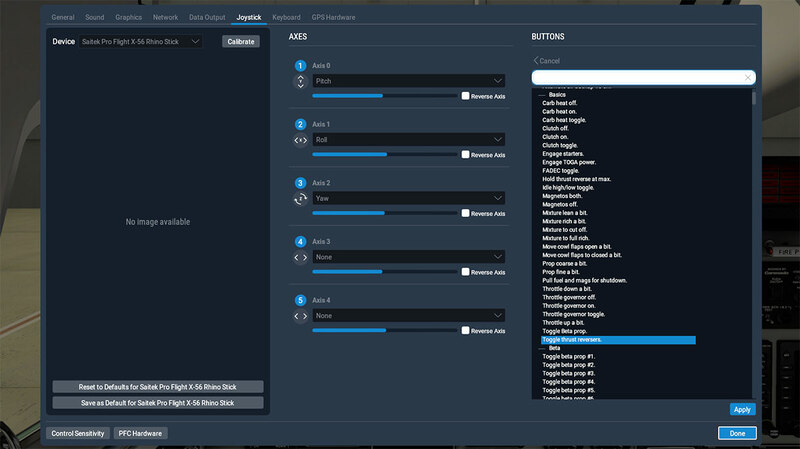 Note the axis items 3 & 4 is the joystick left hand side toggle switch in a scroll mode. 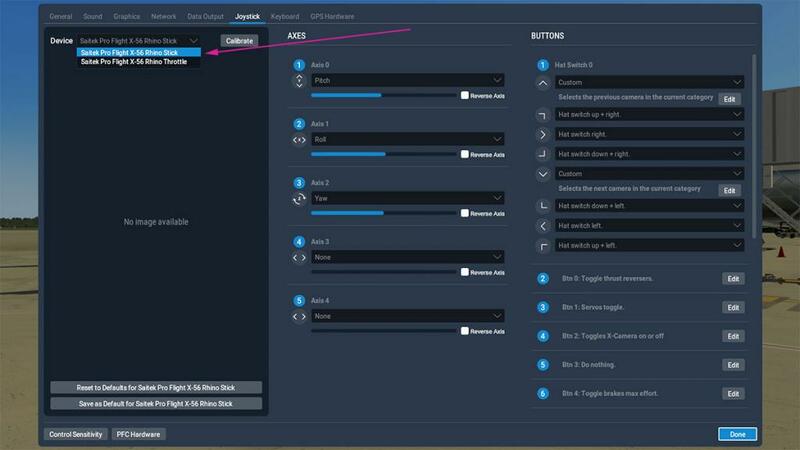 When done you do have to however clear any none usable axis zones by clicking the "Ignore Axis" tabs by each slider and it will show "Ignored" to note the axis zone is deleted, only then will the "Next" button allow you to move on to the next item. 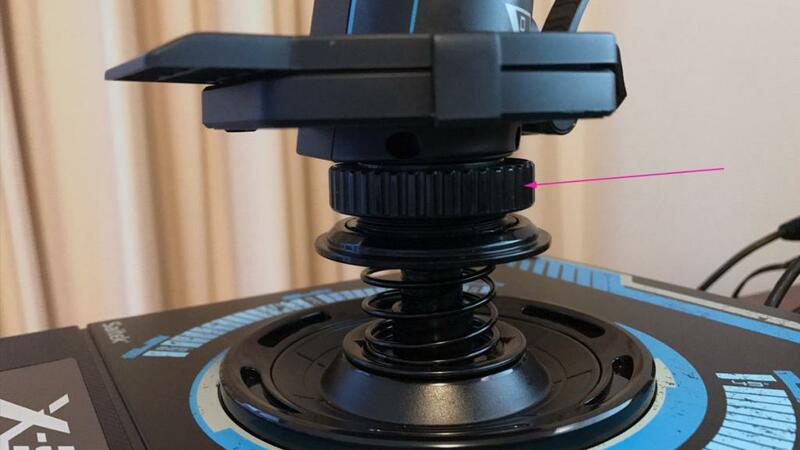 Which is the automatic calibration (nullzone) of the joystick (below left). Now your Joystick is calibrated. Now you can set up your HAT and button, switch or trigger choices by pressing the item on the Joystick (or Throttle) you want to choose which is highlighted white. Note the POV HAT uses the top "Hat Switch 0" selections. Thankfully a major new feature in X-Plane11 allows you to use the search box top right to narrow down your selections... brilliant. 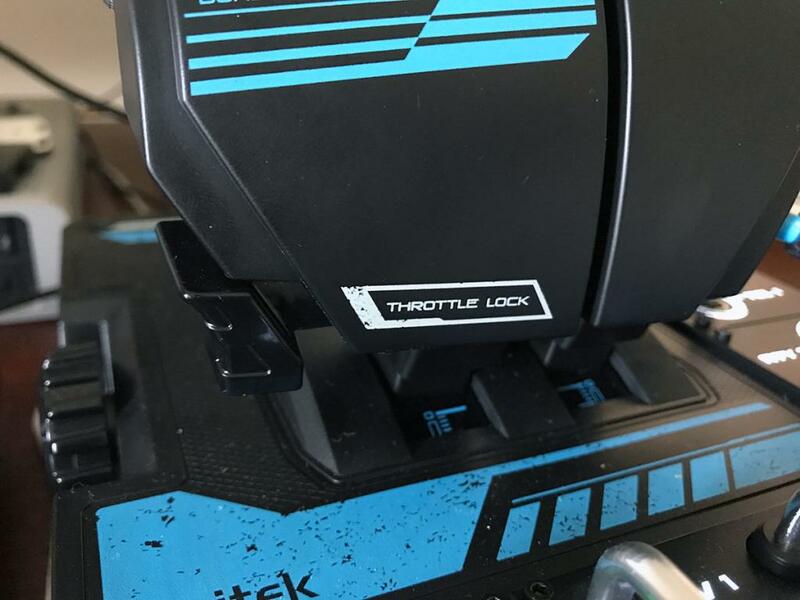 Throttle page is set up the same way (top right). Except with the calibration selection "throttle 1" & "throttle 2" for each throttle. All button, toggle, switch or slider selections are done the same way as with the Joystick. I noted that I really liked the x52 Pro, but it had a few quirks that I didn't like. 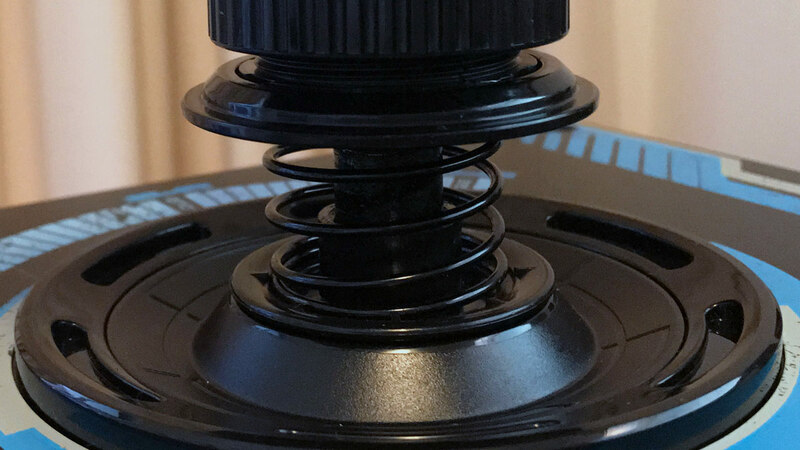 First and the biggest one was that on the x52 Pro the disk would drag badly up and down the centre shaft, no matter what you did. I used (a lot) of petroleum jelly or vaseline to keep it lubricated. 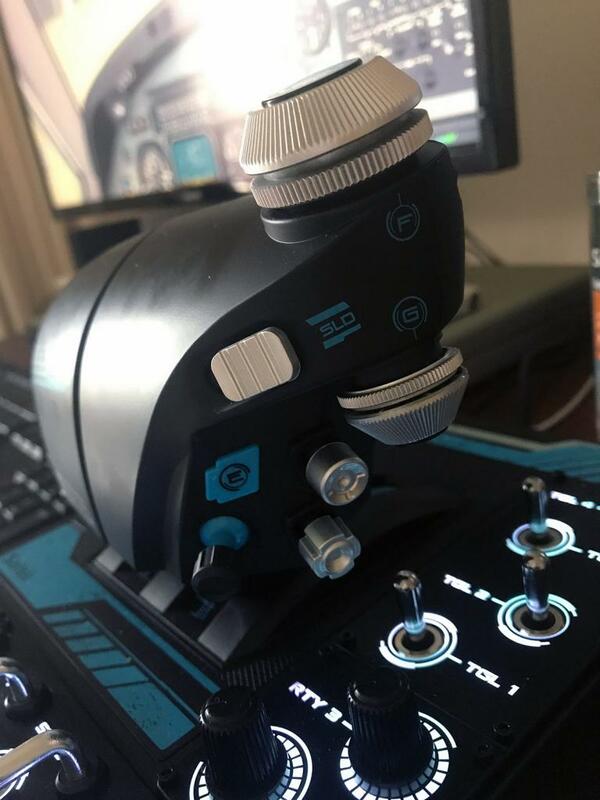 It worked but most times my takeoff's were mostly still very ragged with the joystick sticking at the worst points... the x56's new spring feature eliminates the problem, I like also you can adjust the pressure to suit. I did put a little vaseline on the centre shaft to help with the movement as you still have a disk on the centre shaft. 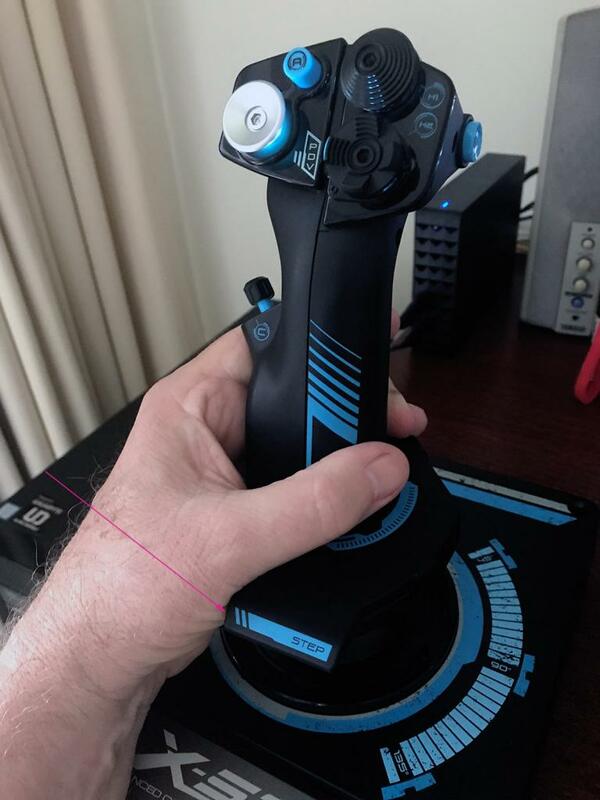 Overall all the x56's joystick movements are very good, but there is small "click" and movement in the center of the yaw that can hinder a little. This is caused by the top section slightly dragging on the lower section in the left - right movement action. The bottom assembly feels a little rough in parts as it came out of the mould. I don't know if I got an odd unit or they are all like this, but a small file and a little lubricant fixed the clicking and I have no doubt that in time it would wear in perfectly as it is already doing so and the yaw now feels great. I will note that I am very if over sensitive to drags and clicks, but that is a personal taste. 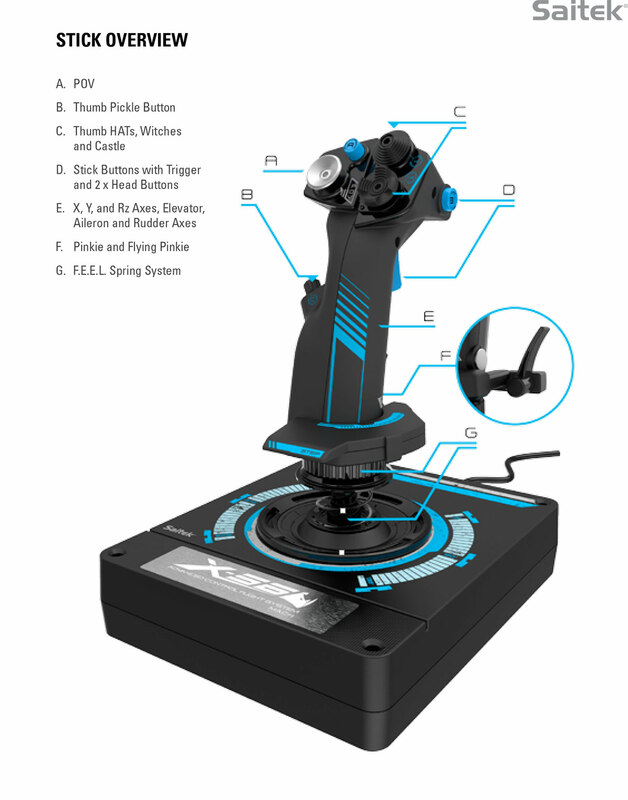 But I really like the weight and feel of the x56 Joystick with the correct spring setting and it is very good for those minute movements in taxiing or helicopter flying and altogether there is 6 Degrees of Freedom (6DoF) within the joystick's axis. The change of position of the switches to the throttle base makes me smile as well, with my speedbrakes-landing gear-flaps layout there it feels perfect and real, real also is the flick of switches in turning on/off the aircraft lighting, as all the switches are precise and click-clicky. Some toggles and rotary dials do feel a little plastic but (mostly on the throttle handle) but most hardware is like this today. 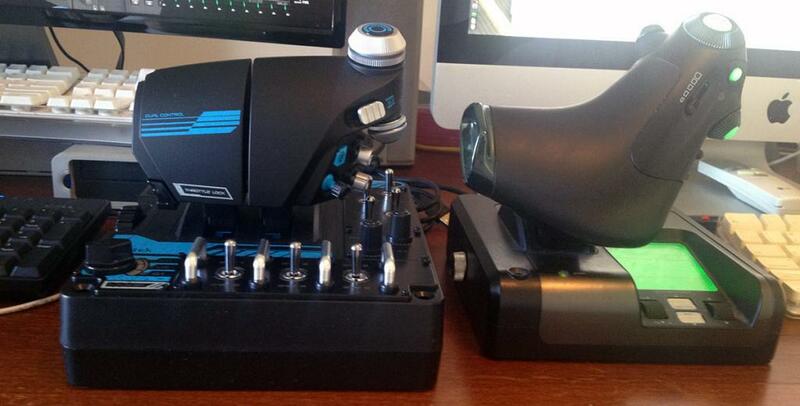 Twin-throttles are brilliant, yes and loving it more because the detents in the x52 throttle have also been removed. I didn't like them either because the throttle would stick again at the very wrong place. Idle was awful on some aircraft and flying at mac speeds created a choice of m80 or m83, you couldn't have m82 (where you wanted to be because you had a annoying detent there... gone on the x56 and good riddance. Throttle is stiff, but nice to use, singly they will move easier, but not together, but I soon adjusted to the force and it feels better and better the more you use them. 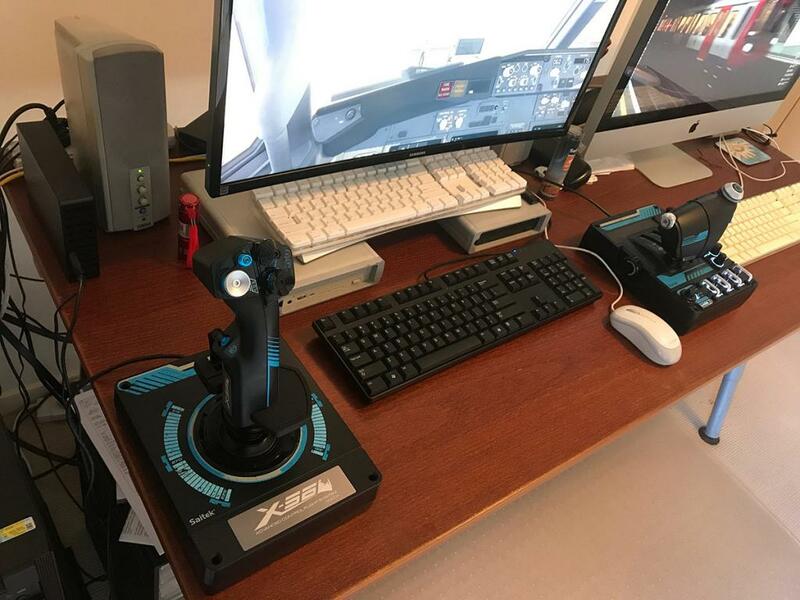 The larger x56 bases do take up more deskspace, but are also far more stable, they don't lift now or move if you push the joystick or throttle too far, so yes another great advantage. Two USB cables on the x56 fixed my screen flipping (jumping) and I have a bigger distance available to the computer if I want to take advantage of that as well. So overall I find the x56 layout a big step up from the x52 setup and it eliminated all of my quirks with the older setup without creating new ones with the x56 Rhino. 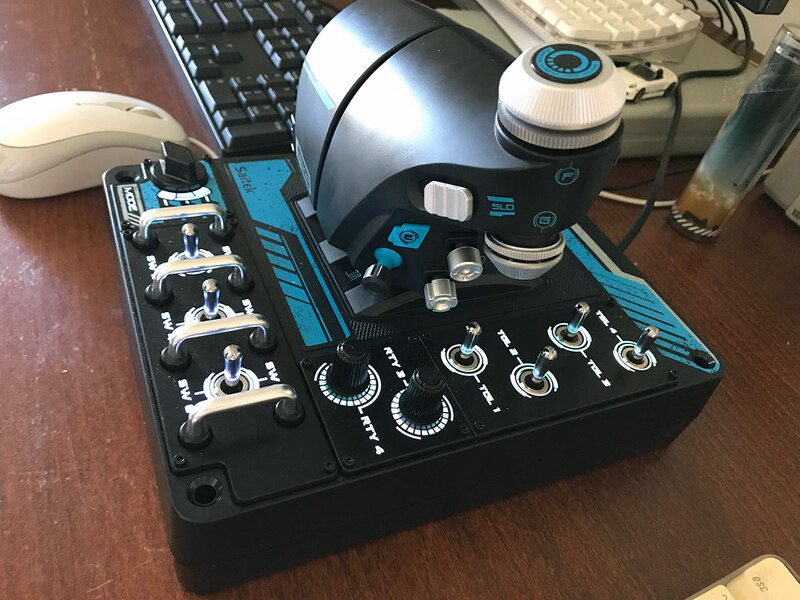 I have listed most of the pros and cons through out the review on why I selected the x56 Rhino to replace my x52 Pro Joystick and Throttle setup. Without doubt the x56 Rhino more than covered all the points that I wanted to be better than the x52 Pro and didn't thankfully add any others to the list. I think it is a far better and certainly a more stable setup than the x52 Pro. More switchgear, more functionality that will take time to set and find the best use of all the huge amount of selections with 231 programmable selections that you can use, and the layout of less on the Joystick and more on the Throttle base in switchgear feels and it is better to use like a real aircraft setup. Only points I will make is the yaw movement (was) a little notchy centre and the downloaded software was out of date for Windows 10 (drivers are fine). As to the look and feel of the x56 Rhino, I love it and even admire it (great in the dark while flying long haul) and for X-Plane connectablity and functionality it is top rate. The proof though is in the flying, no doubt the x52 Rhino will help in my flying in its functionality and use. 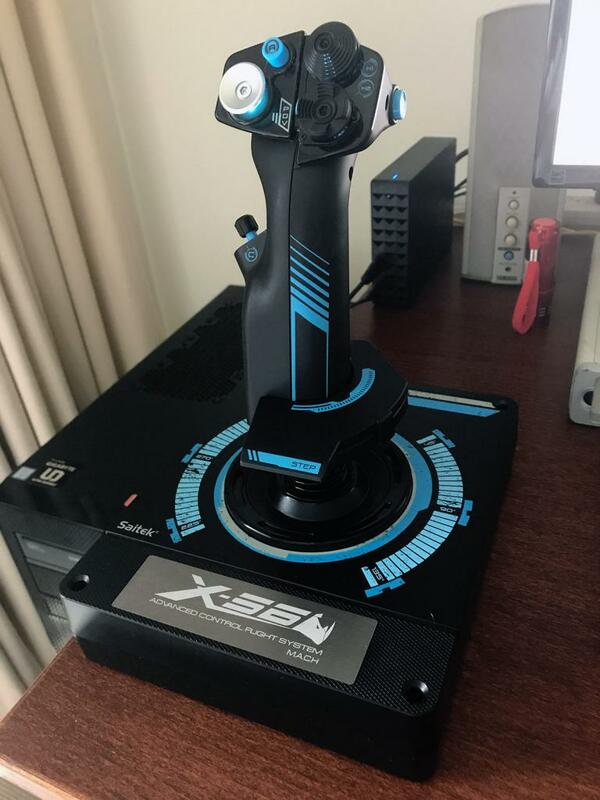 Is the x56 the best combo Joystick and Throttle system out there, many users have their own personal opinions about that, but I think yes, certainly a great upgrade step from the x52 range but also overall for value, more functionality and features I think it definitely is. 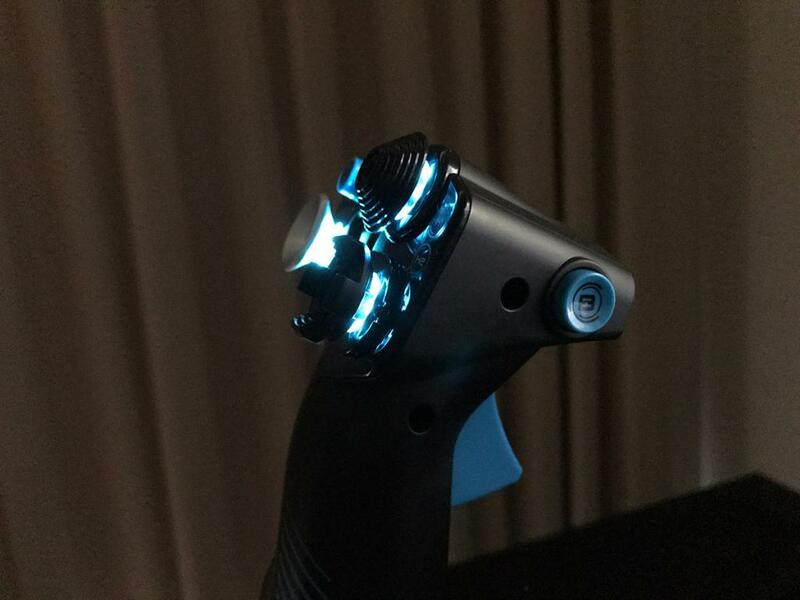 A ground-breaking, adjustable stick spring system allows pilots to alter the force required to move the stick. Four springs of varying resistance are included to provide a total of five different options. 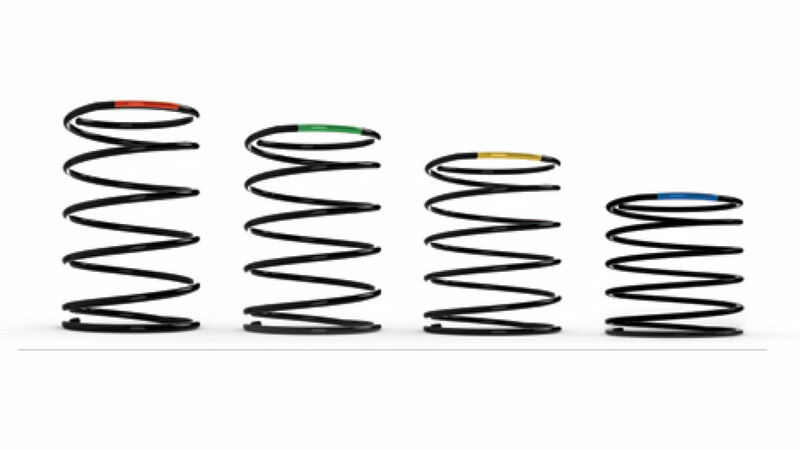 Choose the spring or no spring at all which best accommodates your style of flying. The X-56 Rhino boasts twin throttle and ideal for situations in which your primary engine is disabled and you're down to one and also provides the option to adjust the friction required to move them. And if your aircraft of choice is single-engine, a handy throttle lock effectively converts the twin throttles into a single unit. 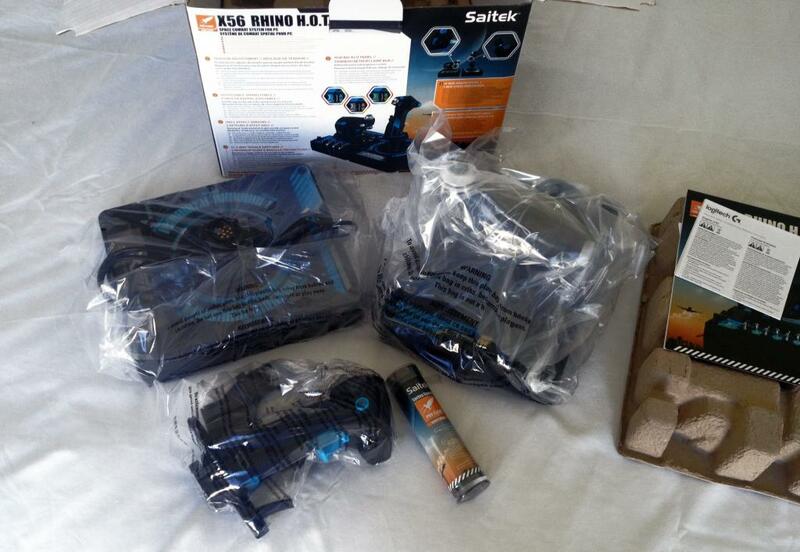 All Drivers, Software is downloaded from the Saitek site. 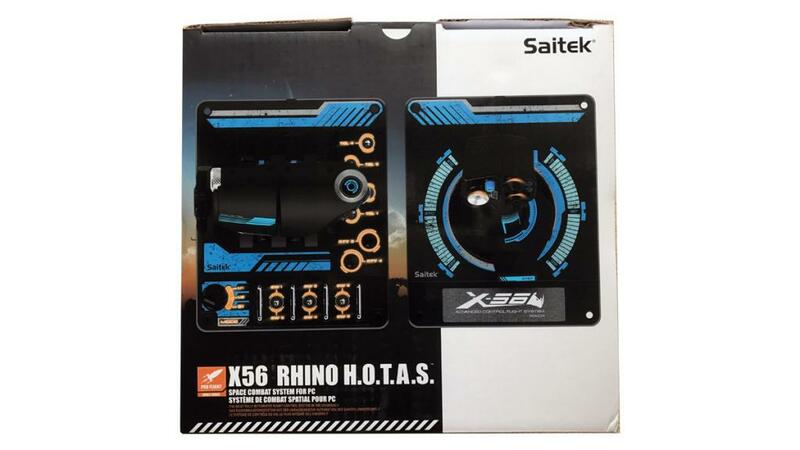 Outstanding review Stephen - very helpful, gave me confidence in making a purchase of the X-56. Any chance you would be willing to upload your X-56 profile file for x-plane 11?